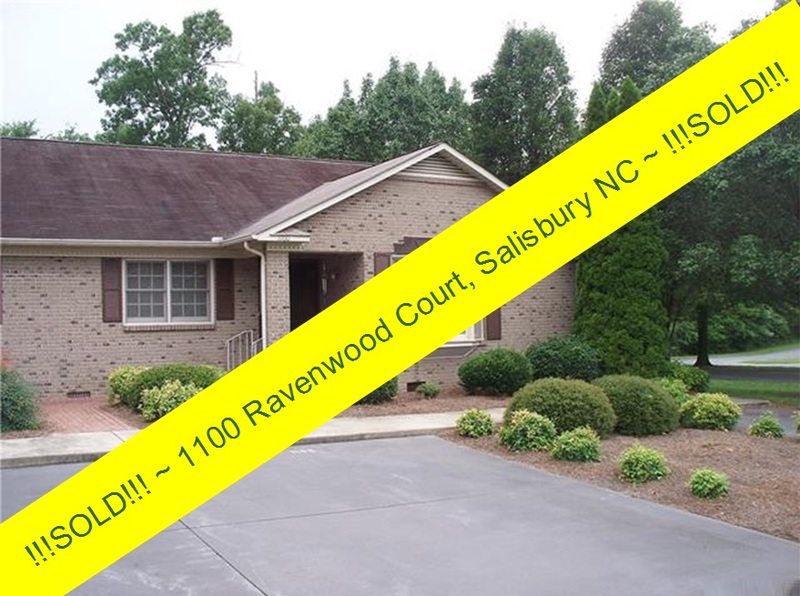 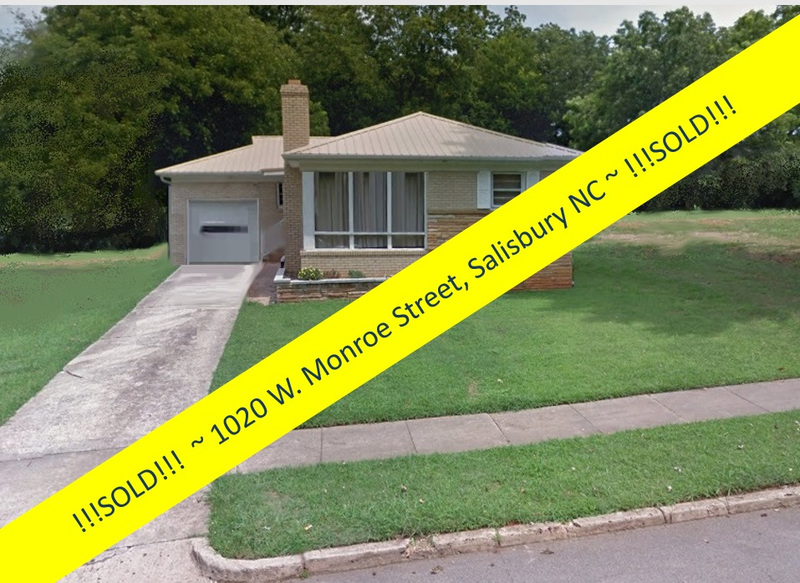 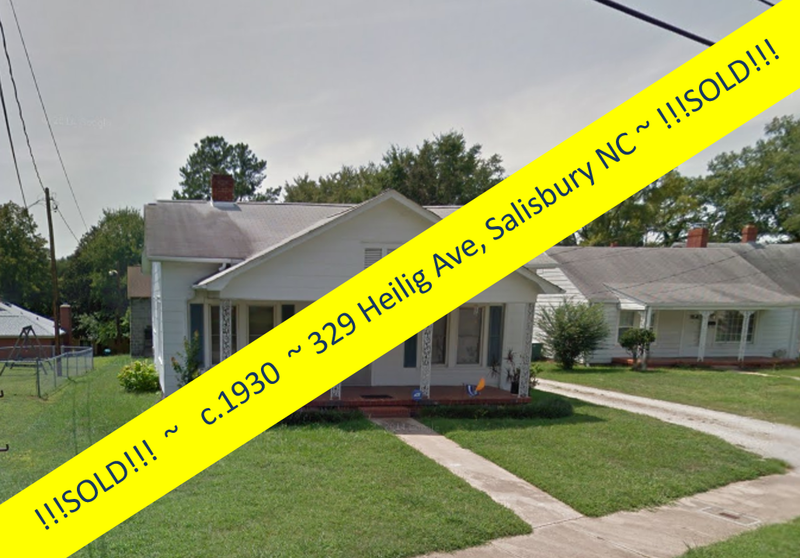 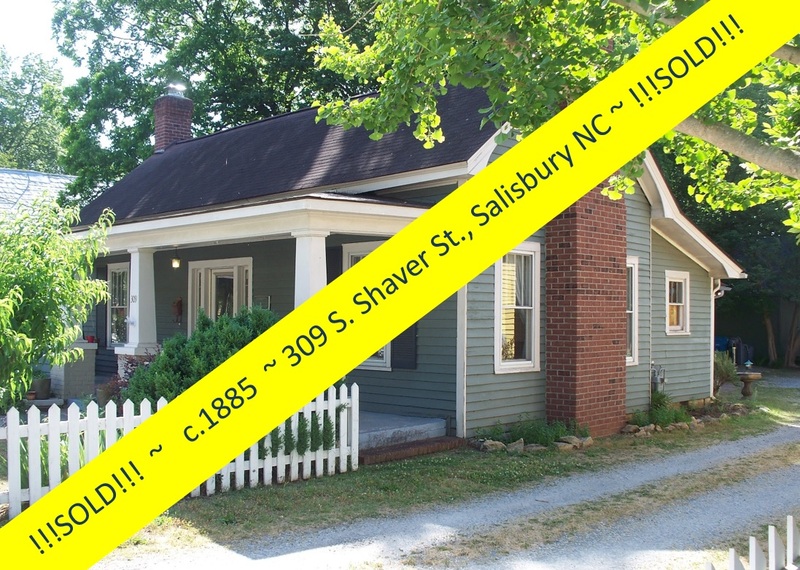 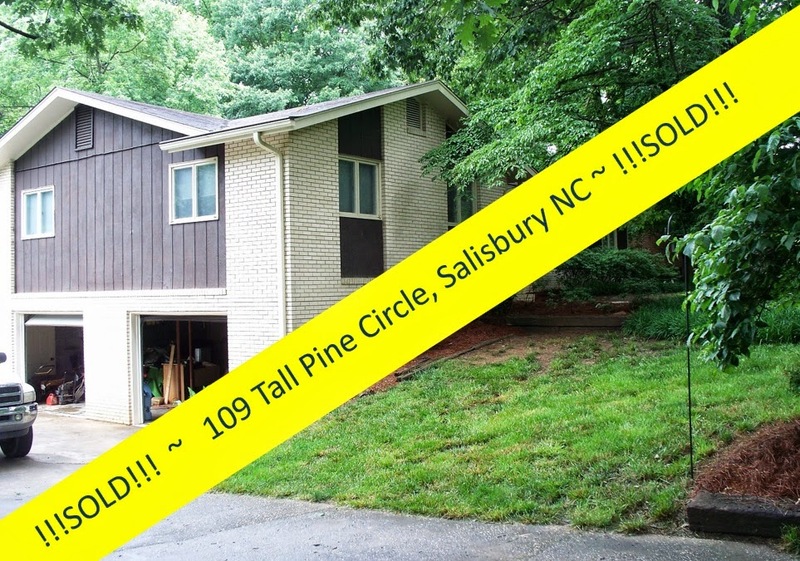 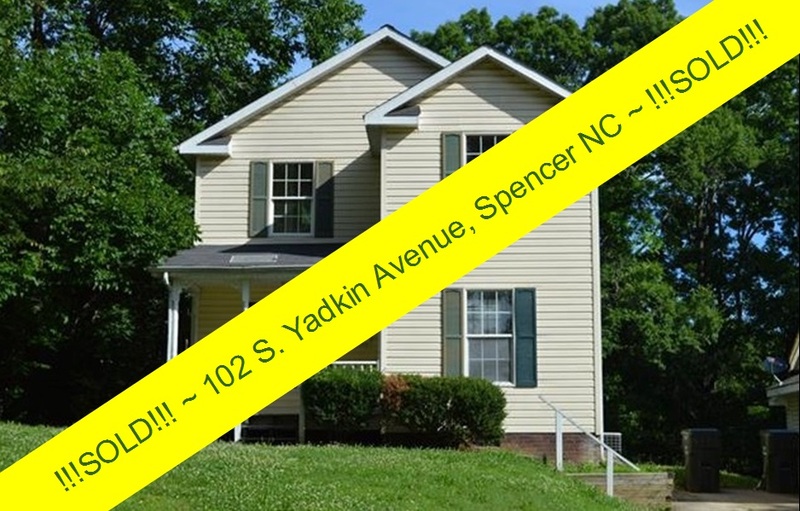 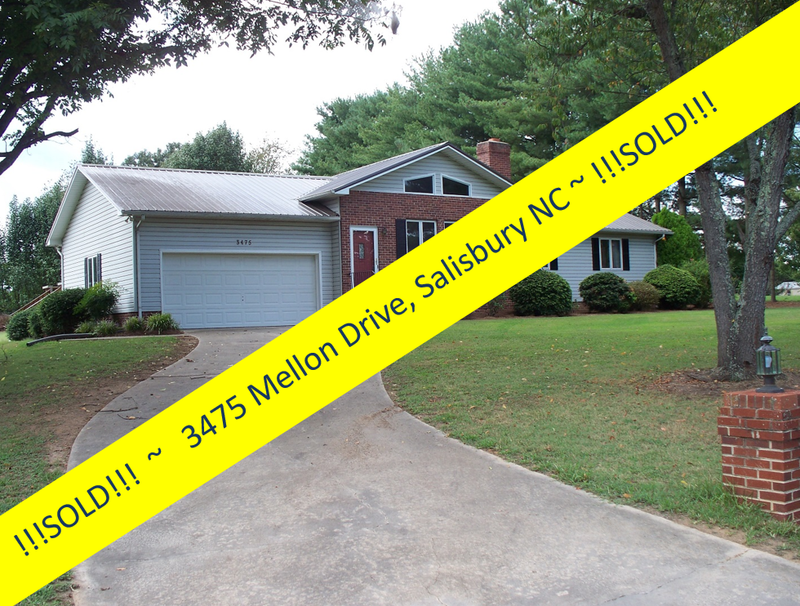 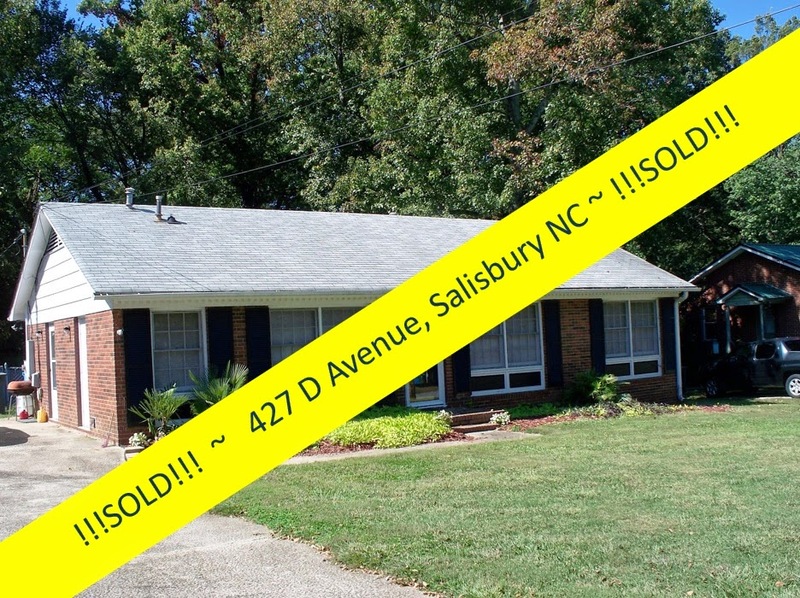 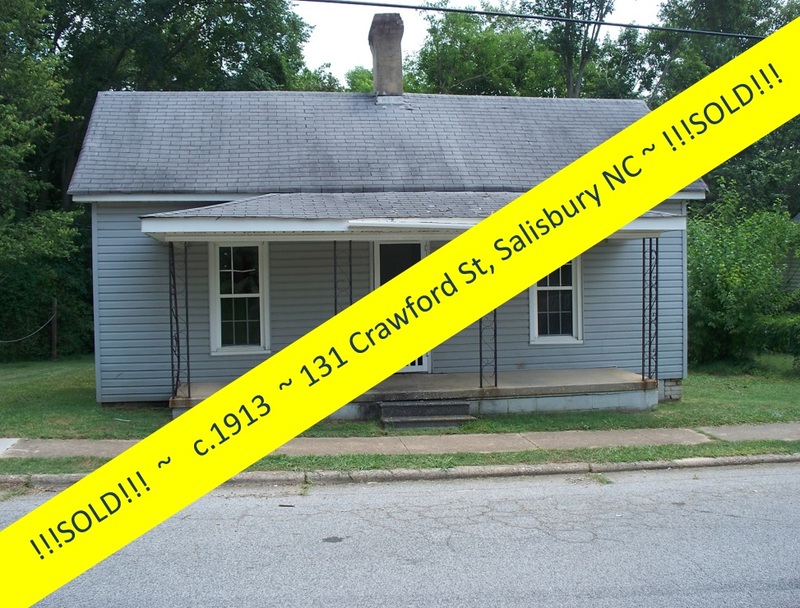 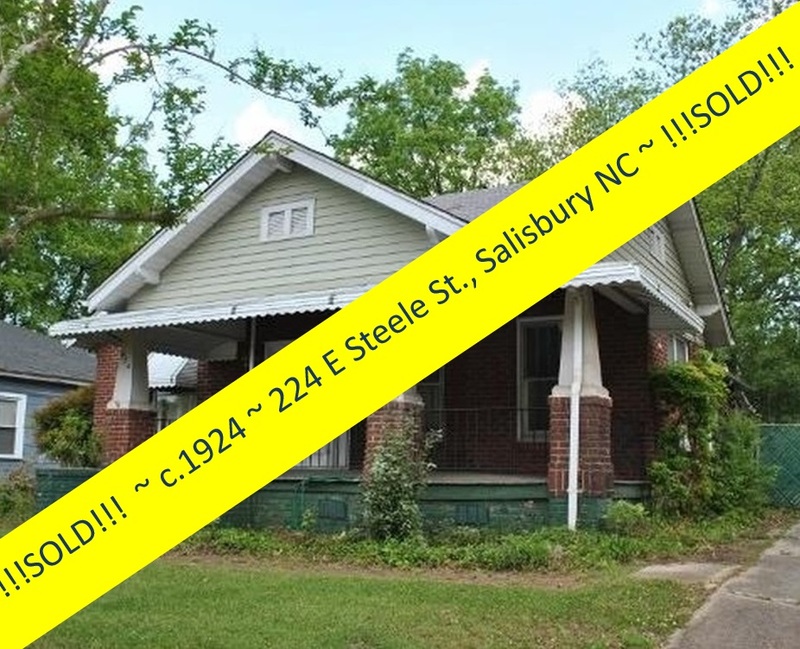 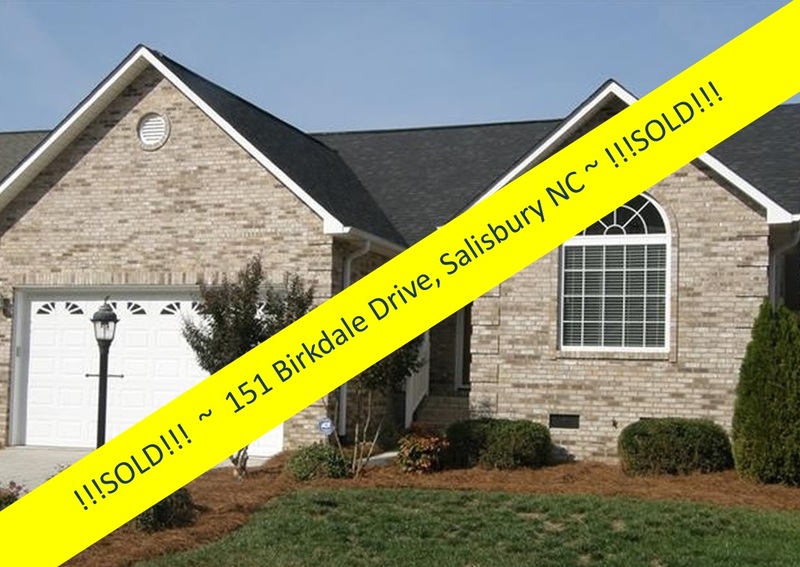 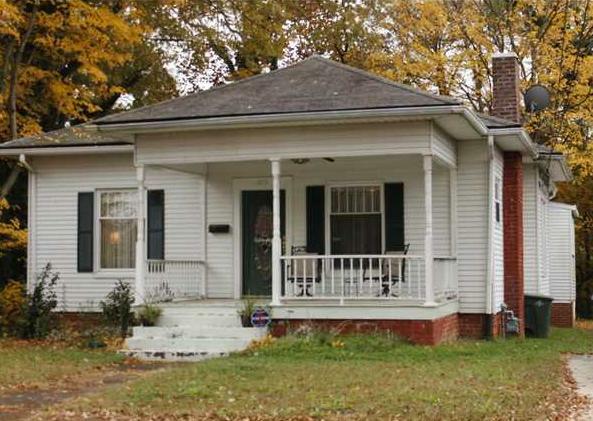 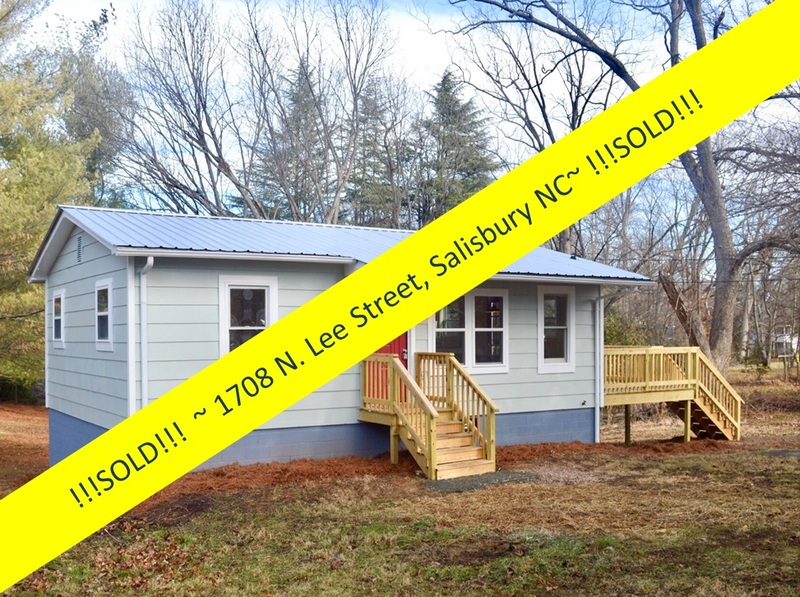 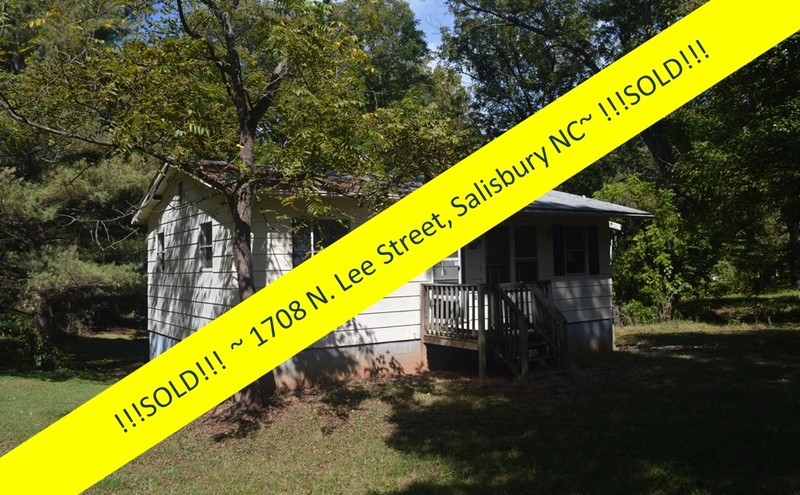 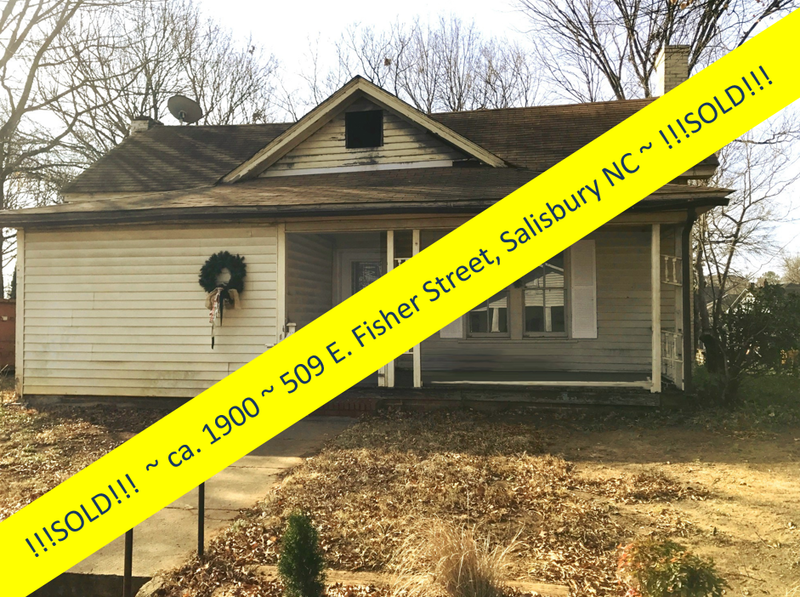 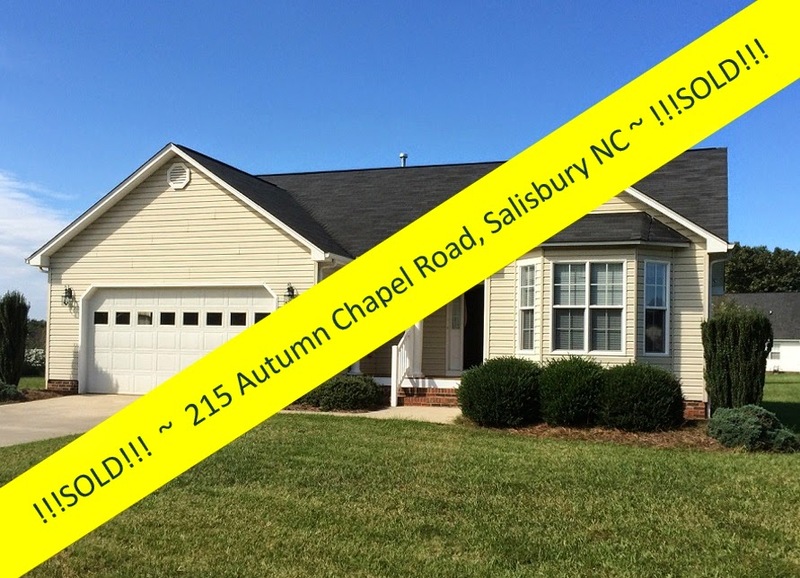 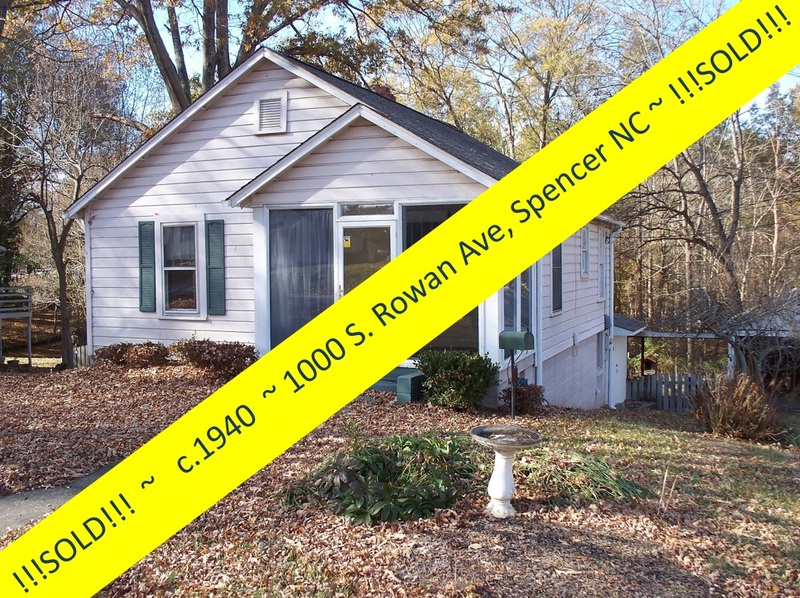 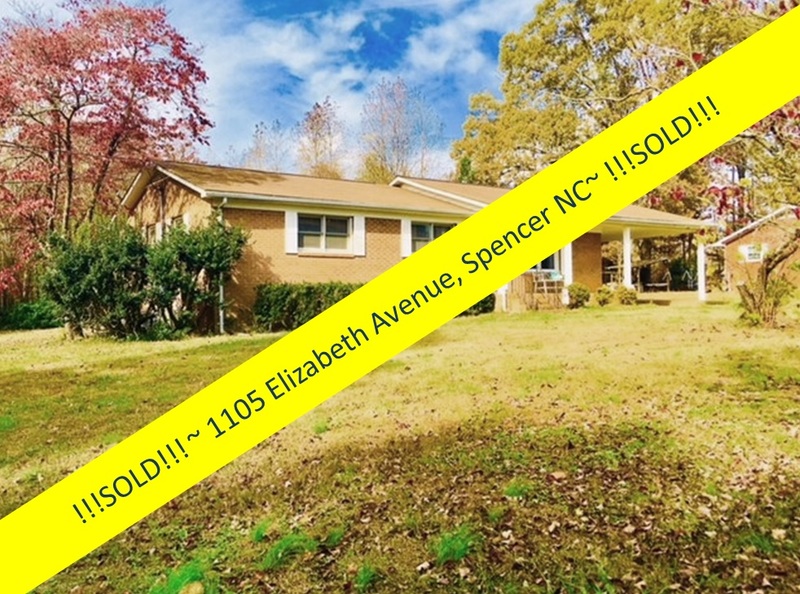 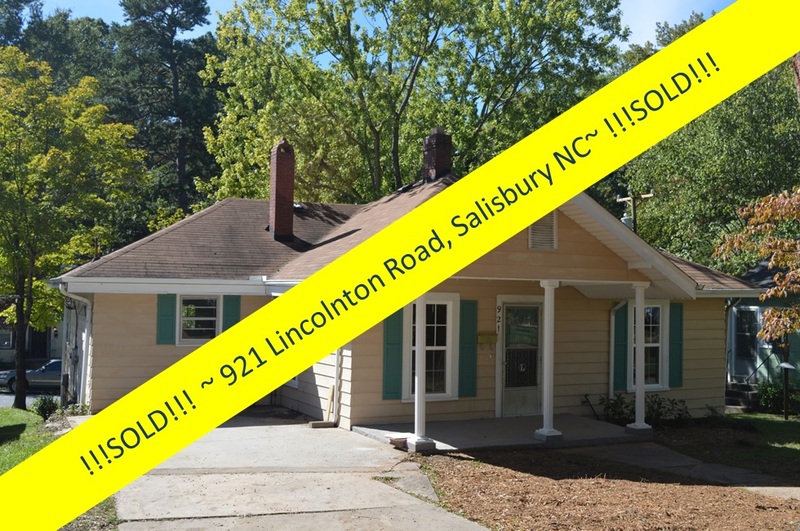 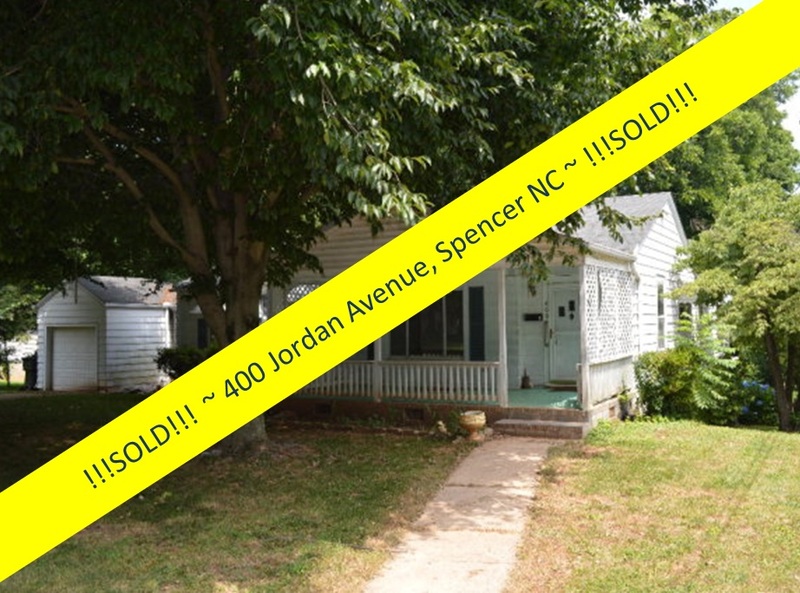 UPDATE (10/15/2014): The Mary Steele Scales home at 126 E. Steele Street in Salisbury NC is now priced at $119,900! 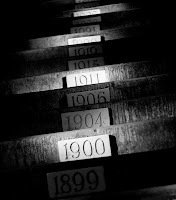 Ah, the joys of aging! 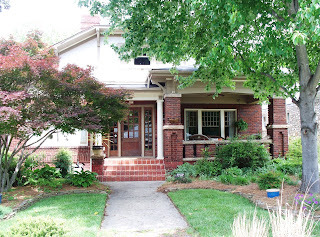 Everything you purchase — furniture, rugs, lighting, artwork . 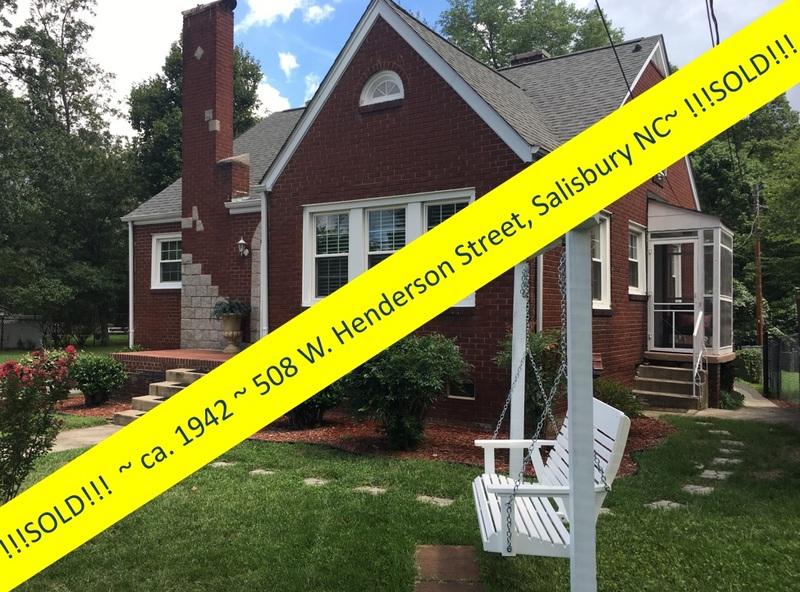 . . and even buildings and homes — can be plotted on an historical timeline and affixed with labels like "contemporary", "antique", "vintage" or "retro". An item's age is a key determinant of its value, considered alongside its condition, quality, and relative rarity. 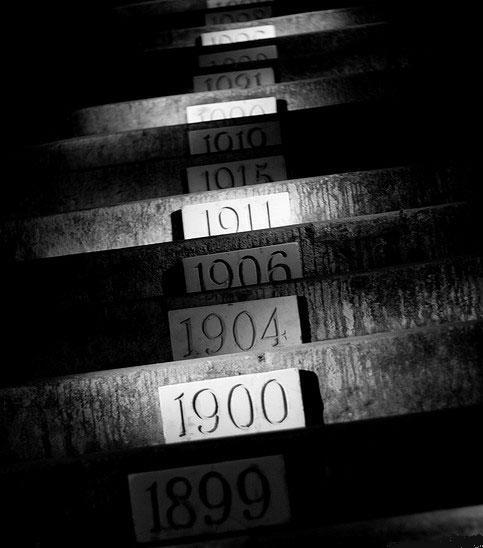 And the age of an item is evaluated not only in terms of its actual date of origin but also in the context of contemporary fashions and socioeconomic trends. 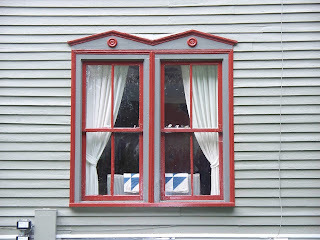 For example, in lean economic times there may be nostalgia for decades associated with comfort and stability. 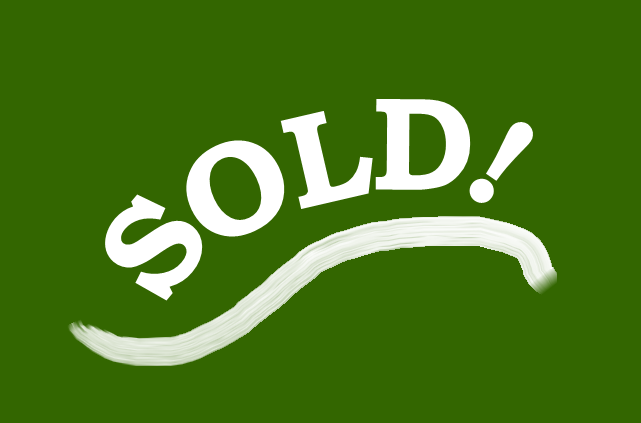 But not everything for sale has a certified date of origin. 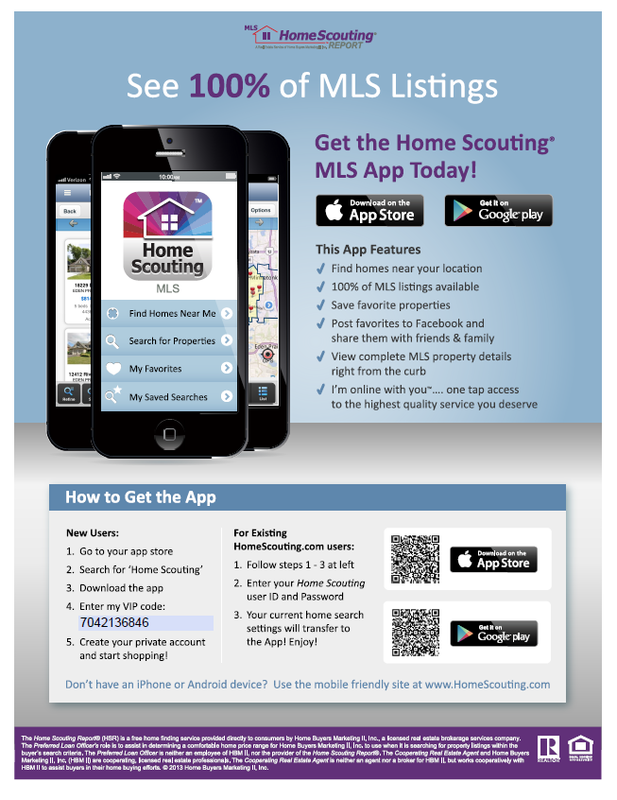 Instead, we have to rely on the often dubious claims put forth by a seller. 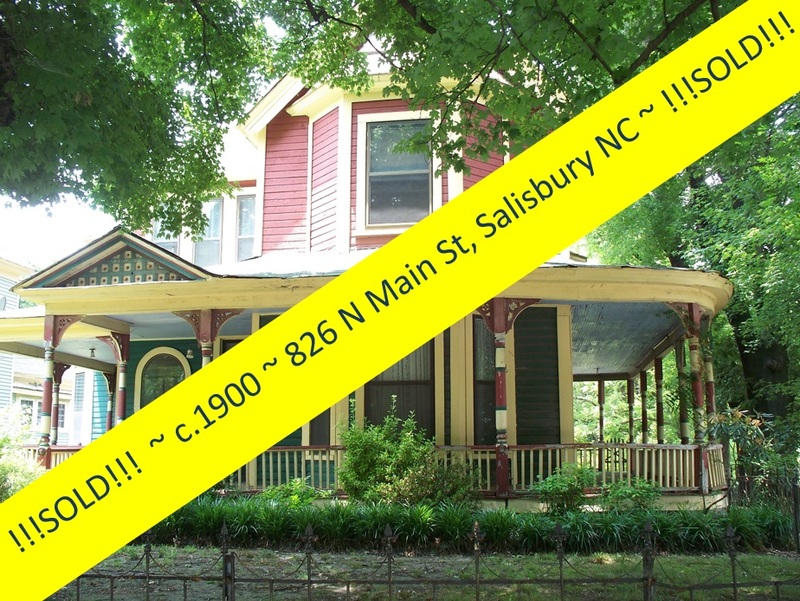 A quick scan of Craigslist or eBay reveals that terms like "antique" and "vintage" are bandied about interchangeably and often illogically. 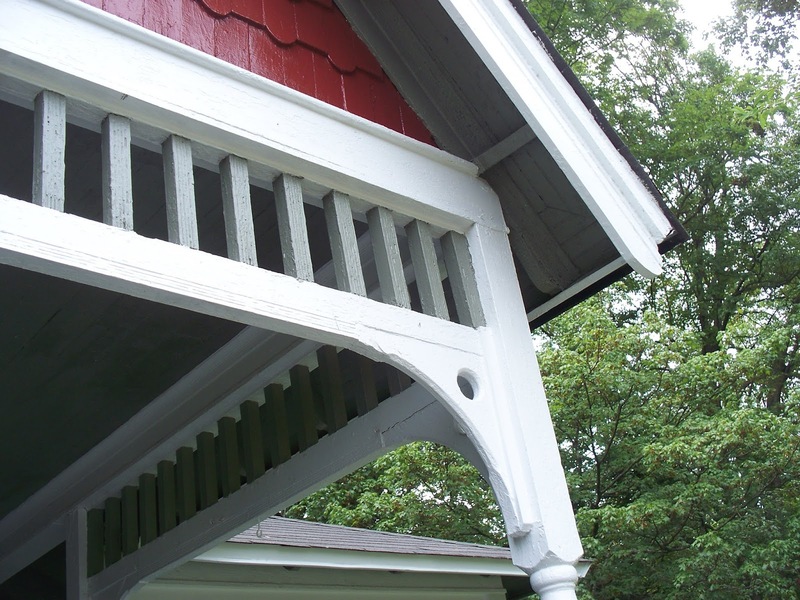 How do you define these words? 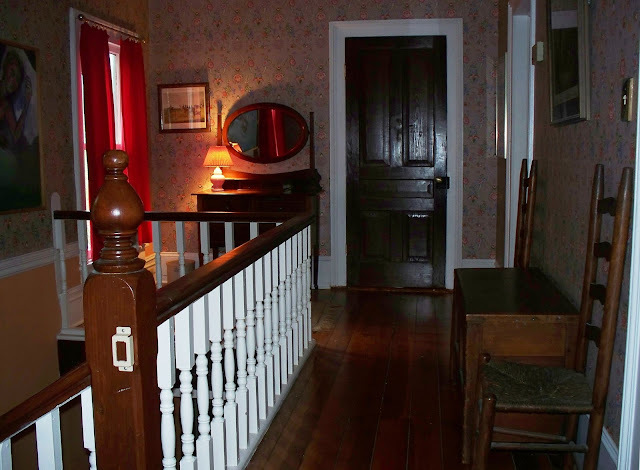 What comes to mind when you hear "antique", "vintage", or even "historic"? 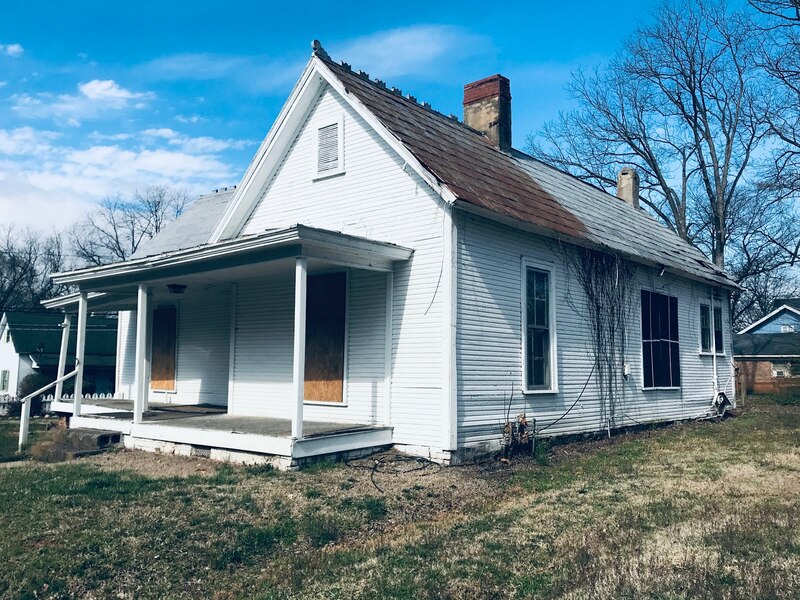 When a home is considered antique, it is defined as "a relic or object of ancient times" or "a work of made at an earlier period and according to various customs laws at least 100 years ago." Most authorities consider the actual definition of the term 'antique' to mean an age of at least 100 years. 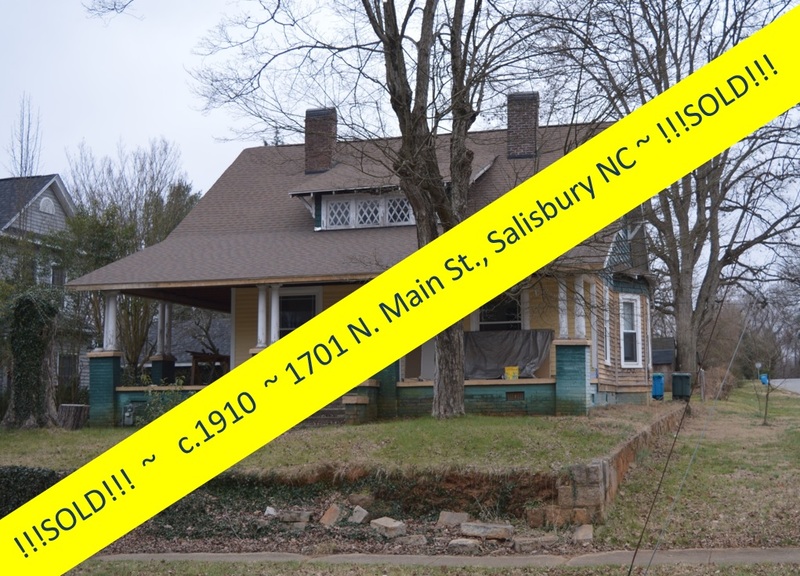 If a home is not definitively datable to 100 or more years in age, it should not be directly referred to as an antique. People use the term "vintage" , often loosely, just to mean "old", but there is more to vintage homes than that. 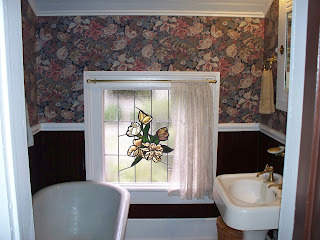 One way to define vintage is "representing the highest quality of a past time". Maturity and a sense of appeal that withstands the test of time characterize vintage homes. 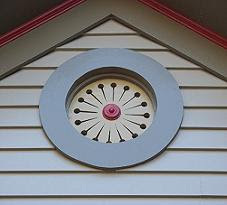 A vintage home is usually very well made with a great attention to detail. 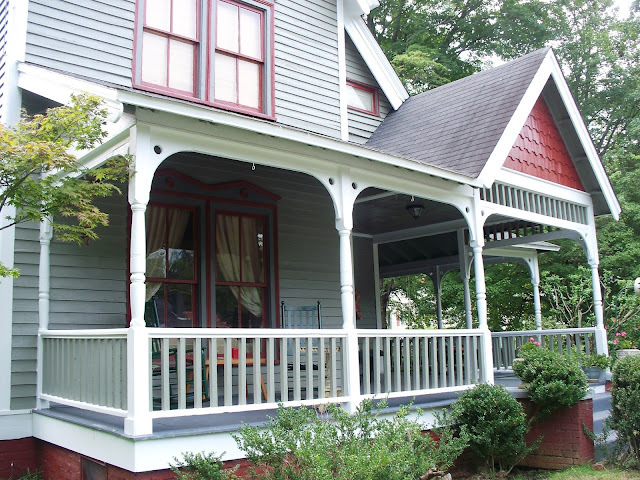 A wide range of architecture styles can be considered vintage. 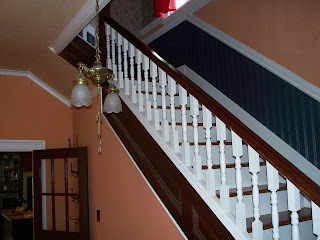 Some agents use this term to refer to all sorts of older home styles, including modern, using the word to describe originals and reproductions that cannot be identified as antique. 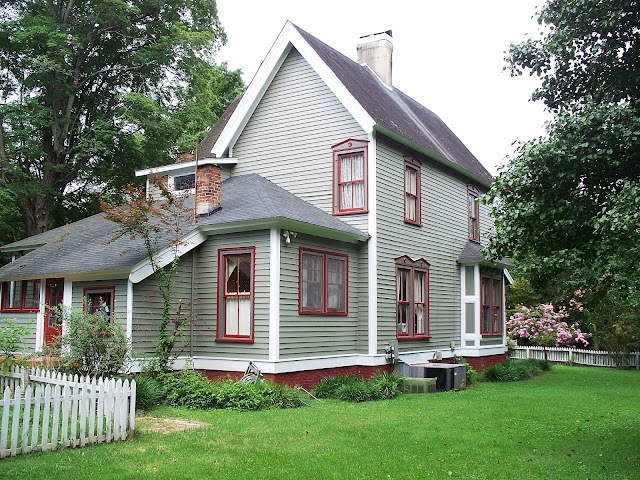 A home or building described as 'vintage' should speak of the era in which it was built. 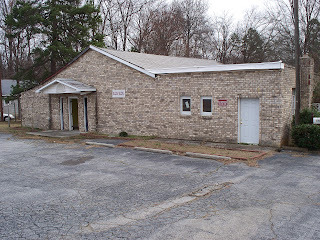 Vintage can mean an item is of a certain period of time, as in "vintage 1950's" but it should always mean that the item exhibits the best of a certain quality, or qualities, associated with or belonging to that specific era. 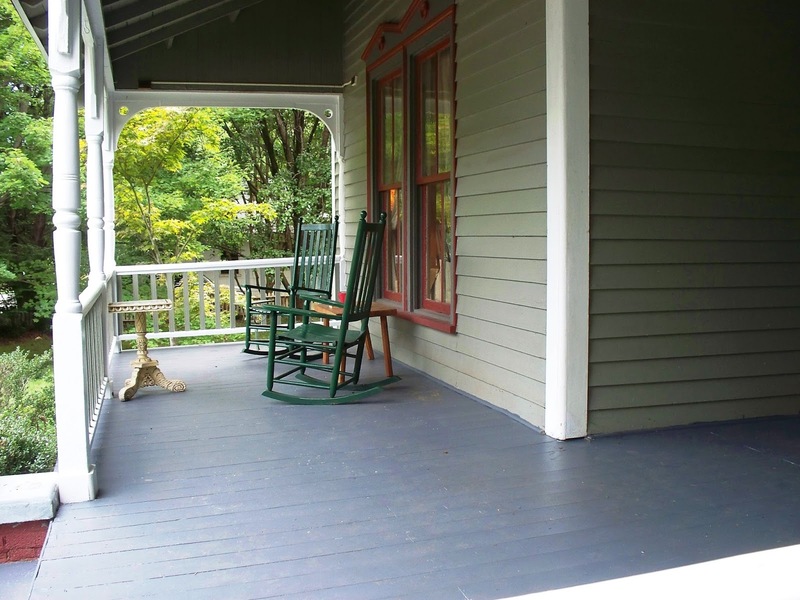 In other words, for the term vintage to accurately apply to an older home, that structure should be somewhat representational and recognizable as belonging to the era in which it was made. But if you are looking for either a vintage or antique home, you will often also hear the word ‘historic’ thrown in the mix. 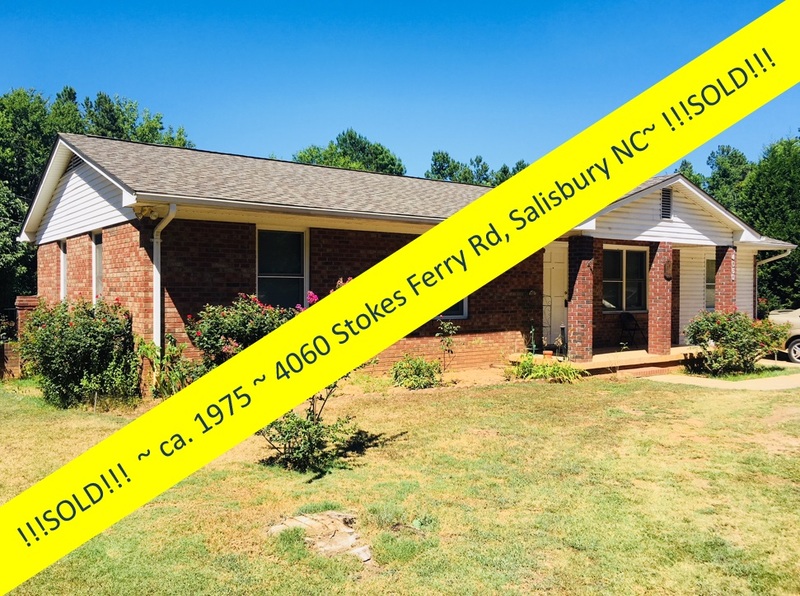 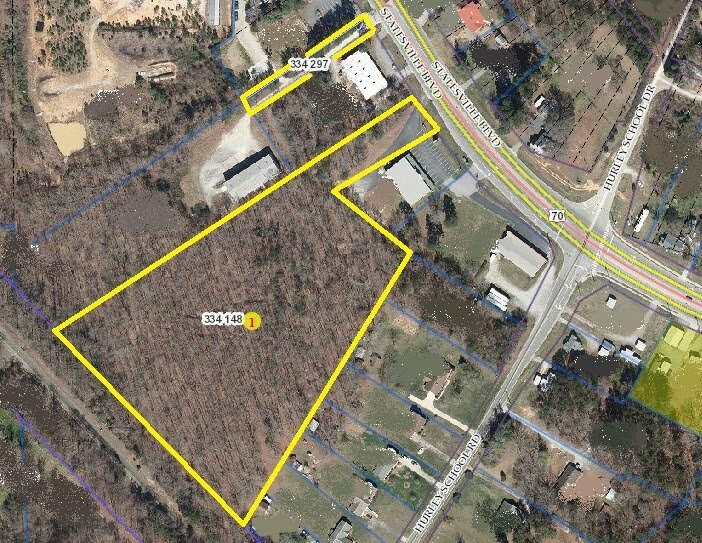 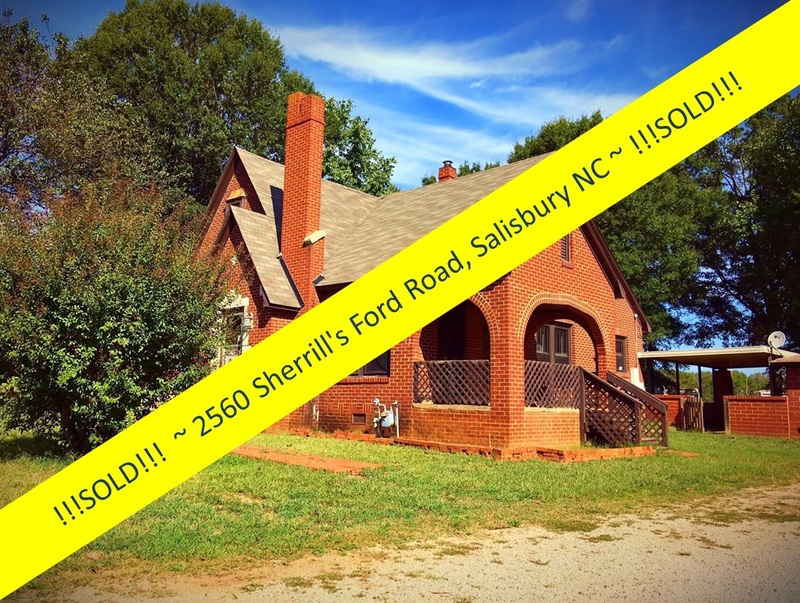 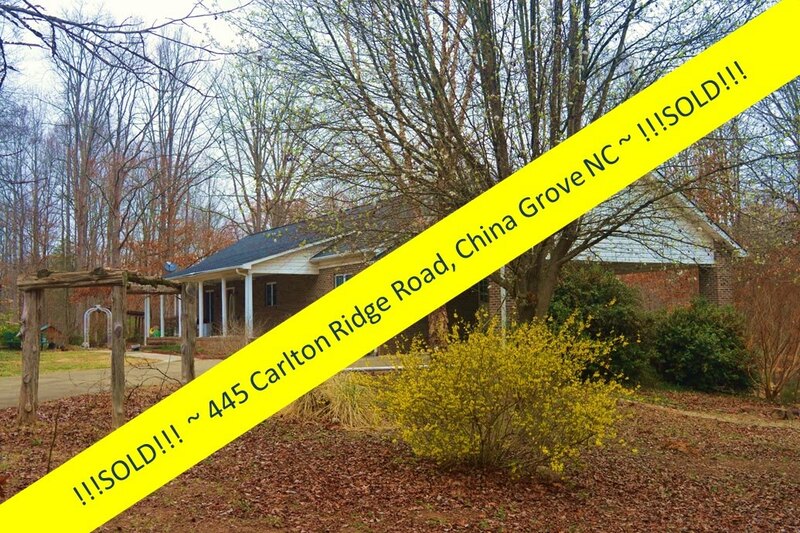 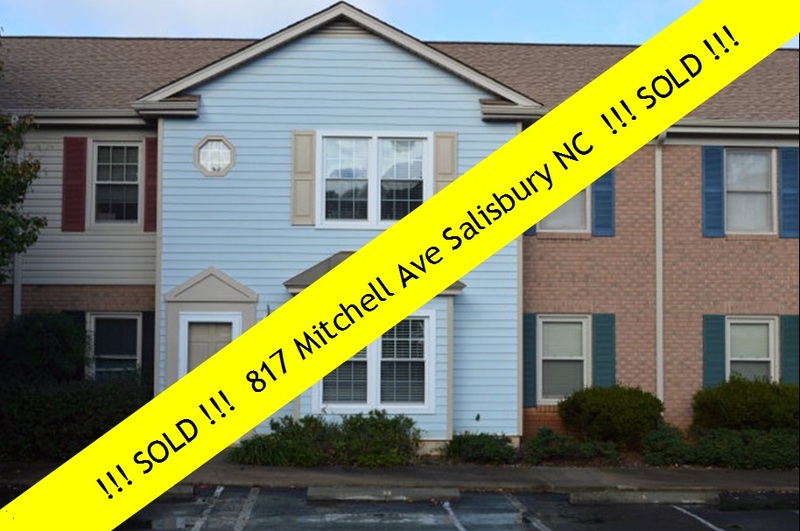 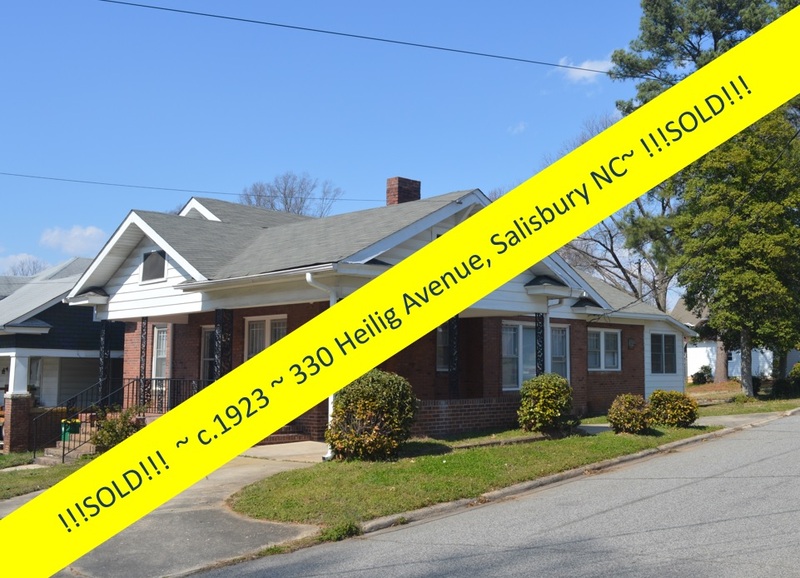 Here is where the cream rises to the top, and where the Mary Steele Scales house rises to the top of the real estate market in Salisbury, North Carolina. 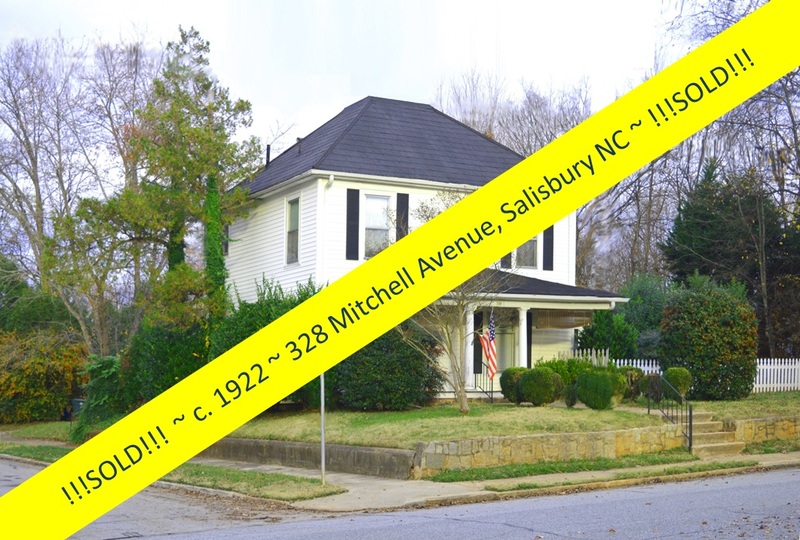 Age: A property must be "old enough" to be considered historic. 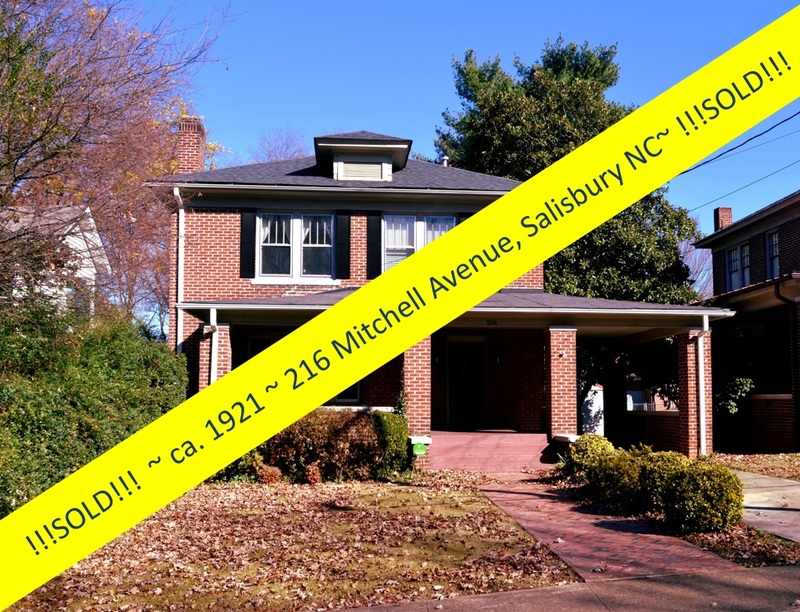 Generally speaking, this means that a property must be old enough to have been studied by historians, architectural historians, or archaeologists so that its place in history is clear. 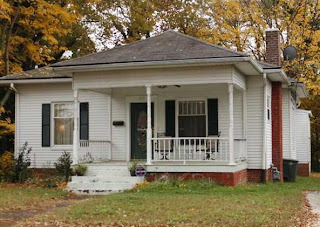 This latter perspective allows some types of properties that are only 50 years old or less to be considered "historic". 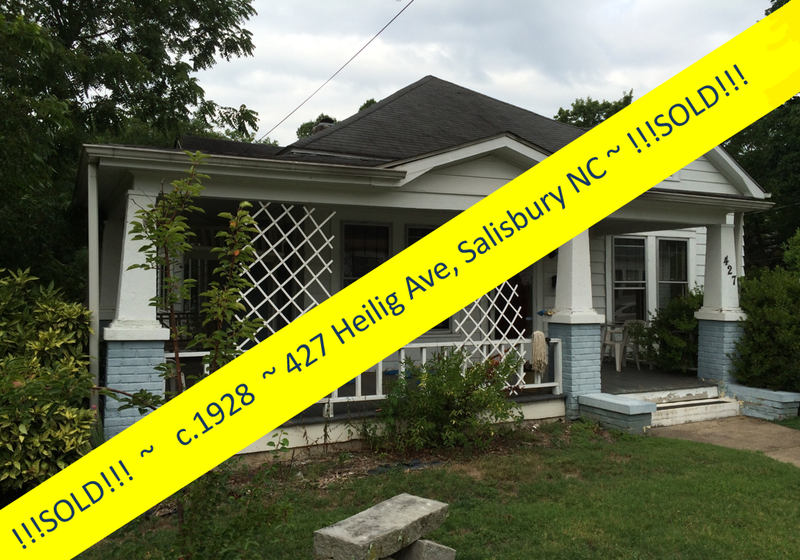 Integrity: In addition to having sufficient age, a property must retain its historic physical integrity. 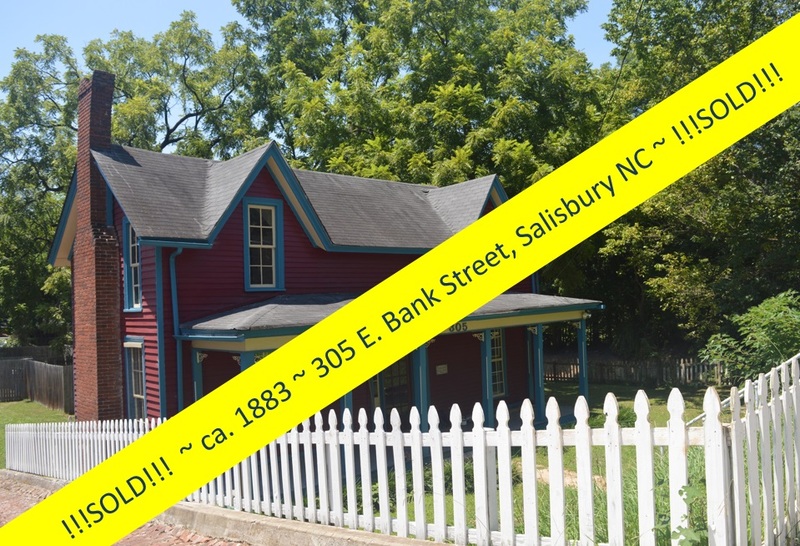 For a building, structure, landscape feature, historic site, or historic district, this means that the property must be relatively unchanged. 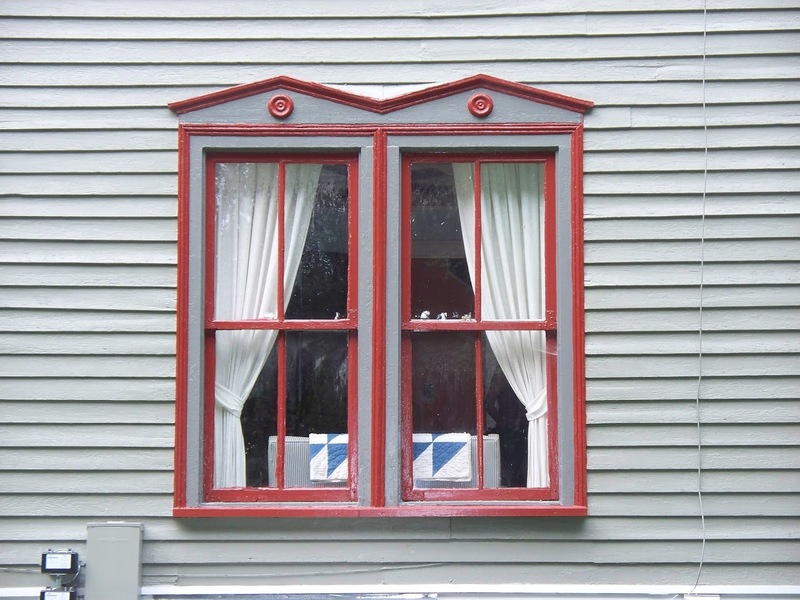 An historic home’s essential character-defining features relative to its significance must still be present, meaning that its character and structure must be relatively undisturbed, with its patterns and layers of historic evidence relatively intact. 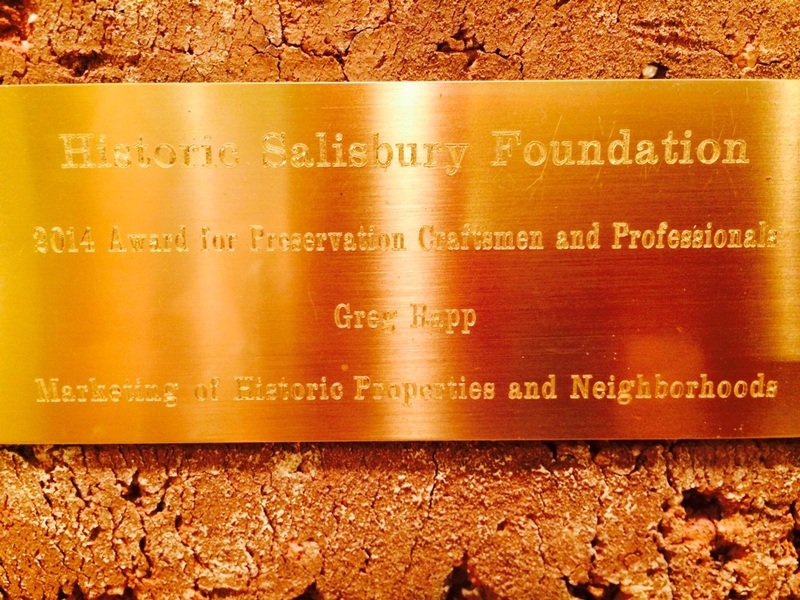 For a traditional cultural property, integrity means that the site must be recognizable to today's affiliated cultural group, evidenced through tradition, and still used or revered in some way. 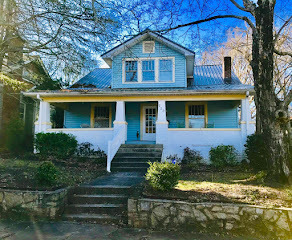 The circa 1893 Historic Mary Steele Scales home embodies all of the above: At 120 years old, definitely an antique home; vintage in that the home exhibits the best of the specific qualities associated with era, and historic. 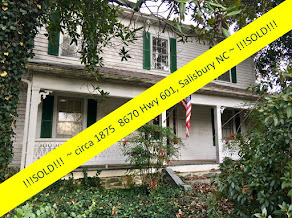 The Mary Steele Scales Home at 126 E. Steele Street in Salisbury, North Carolina sits on nearly a 1/2 acre lot that was once part of the ‘Lombardy’ plantation of John Steele*, (November 16, 1764 – August 14, 1815). 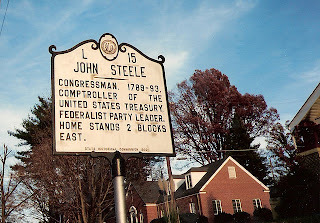 John Steele, born in Salisbury, North Carolina (www.salisburync.gov) in 1764, was a member of the United States House of Representatives from the state of North Carolina between 1790 and 1793, and On July 1, 1796, Steele was appointed Comptroller of the Treasury by President George Washington. 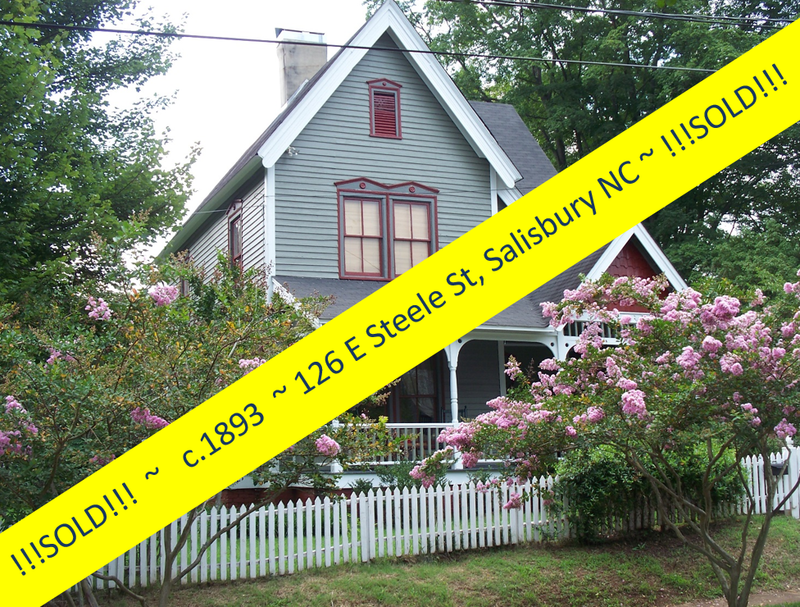 Mary Steele Scales, whose name graces this historic home at 126 E. Steele Street, was great-granddaughter to John Steele & Mary Nessfield. 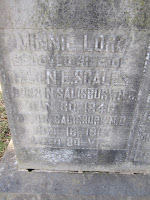 Mary Steele "Minnie" Lord was born to John Bradley Lord and Ann Nessfield Steele Ferrand in 1840. Minnie married Major Nathaniel Eldridge Scales, and the couple lived in the home they constructed in 1893 close to "Lombardy" (John Steele's plantation) ~ now known as The Mary Steele Scales House. 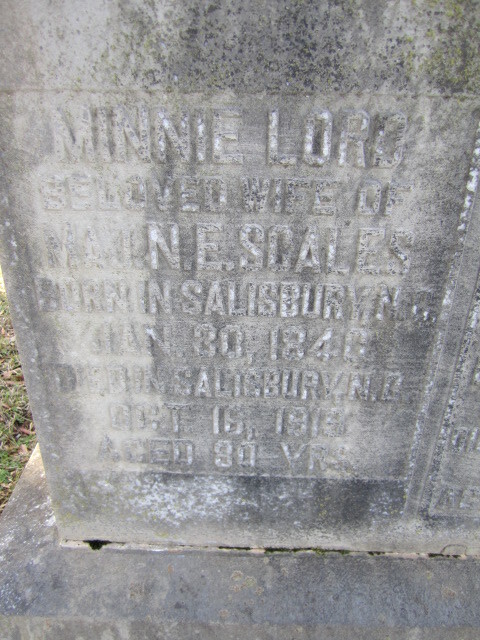 Mary Steele “Minnie” Scales died in 1919 at the age of 80 years and is interred at the Chestnut Hill Cemetery in Salisbury, Rowan County, North Carolina, USA. 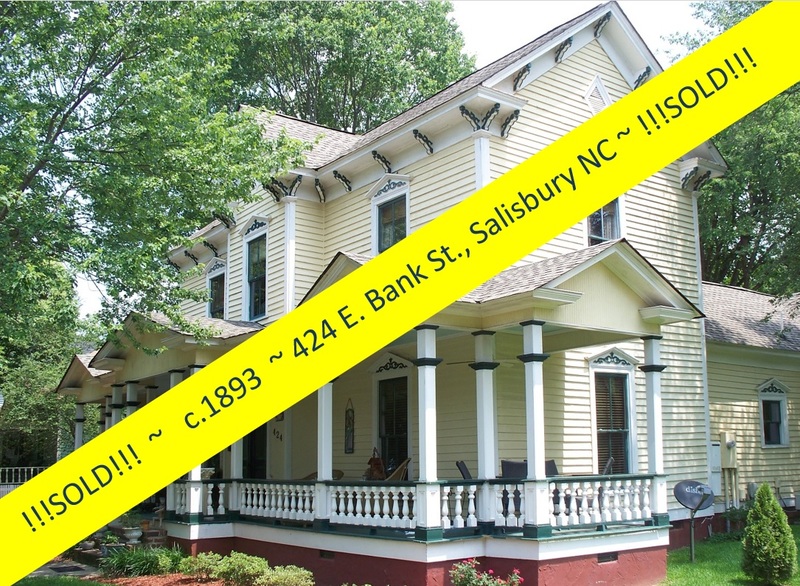 This fine antique, vintage, historic home retains much of its original 1893 exterior and interior features. 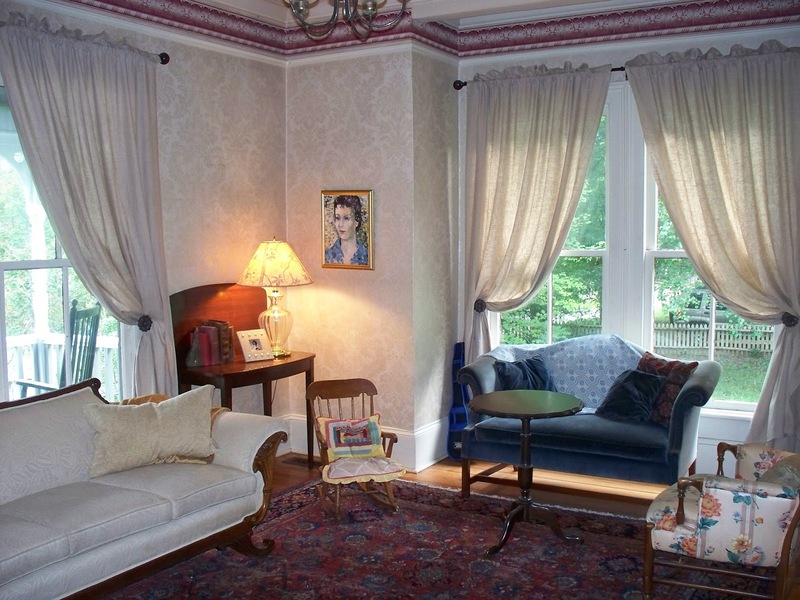 Each room has 10-foot ceilings, characteristic of the era, southern heart-of-pine and oak floors refinished to a smooth patina, and the four fireplaces boast original mantle pieces. 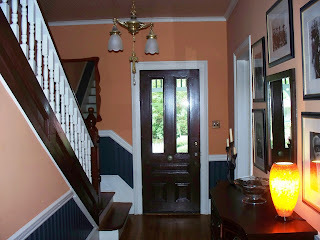 The original millwork is in place throughout the home. The home boasts an enormous nearly 19 x 17 foot kitchen with tons of cabinet space with stained glass cupboard doors, loads of ceramic tile-topped countertop, & a center work/eat island. 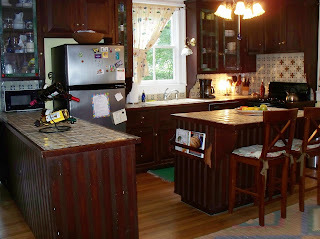 The kitchen sink overlooks the gorgeous (a source of neighborhood pride!) 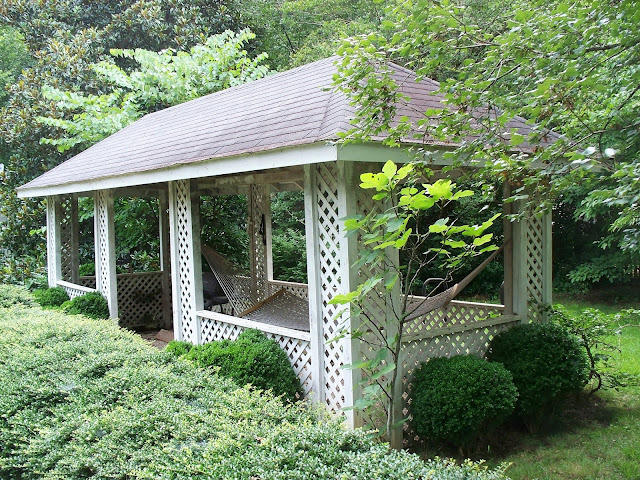 nearly half-acre, very private yard ~ a gardener’s paradise filled with garden beds, mature maples, and a large latticed gazebo . 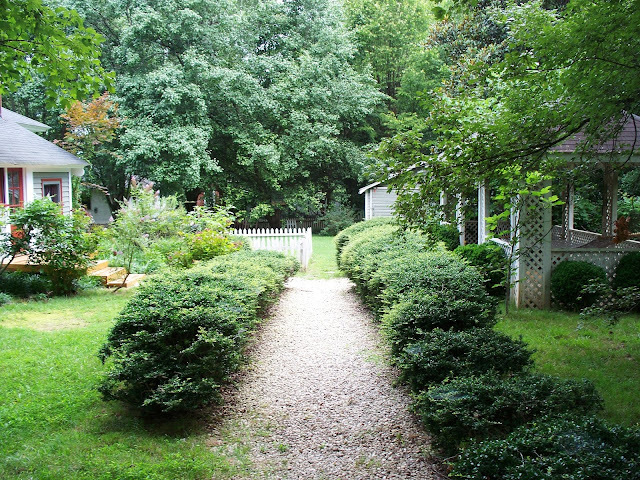 . . all surrounded with white picket fencing. 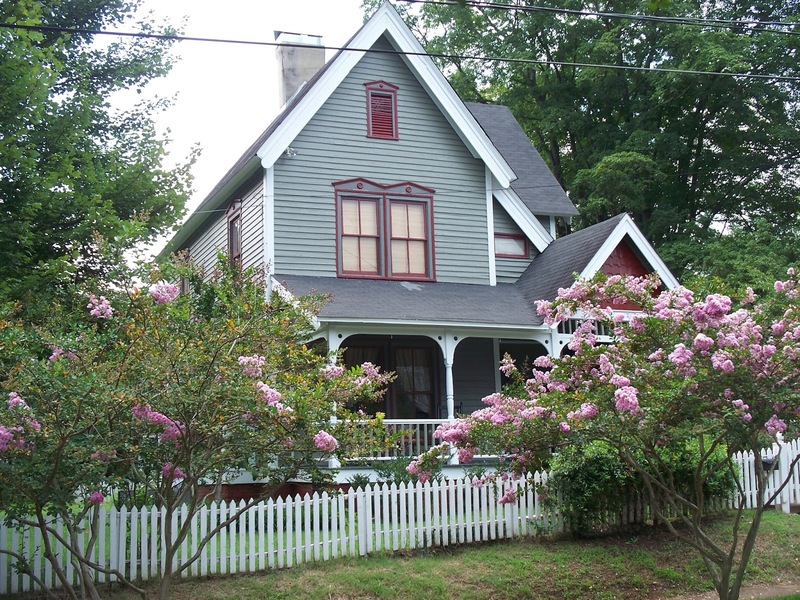 Another fabulous feature, typical of the 1800’s Victorian architectural style, is the nearly 500 square foot wraparound front porch ~ perfect for entertaining, enjoying meals, or for just relaxing, enjoying the crepe myrtle lined streetscape, and taking in summer breezes. Visitors to the Mary Steele Scales House will immediately note the extensive use of stained glass in the home ~ another feature of the 1890 Folk Victorian. Both the upstairs and downstairs full baths feature stained glass windows (the upstairs bath is positioned in a unique step-down from second floor level). 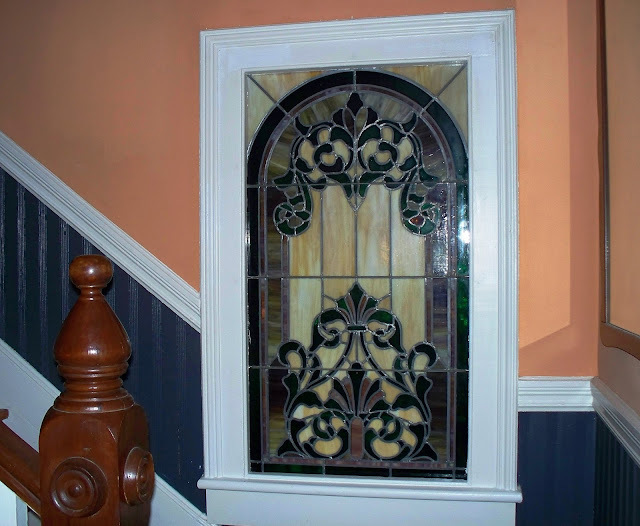 The stairwell landing features another stained glass panel, and stained glass trims all the cabinetry in the kitchen. 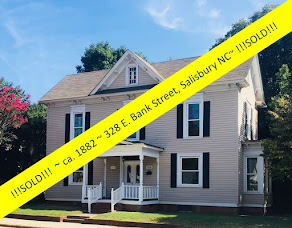 And speaking of windows, the new home owners at 126 E. Steele street are sure to love the bay window in the large romantic first floor parlor. 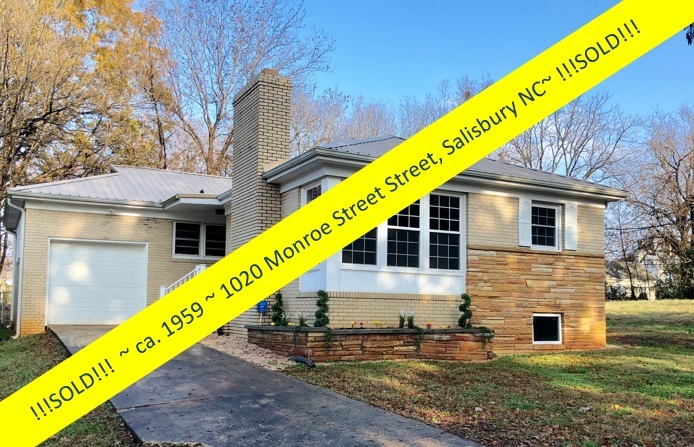 This two-story, 2089 square-foot home features three bedrooms off a large second floor mezzanine, a great place to showcase antique furniture! 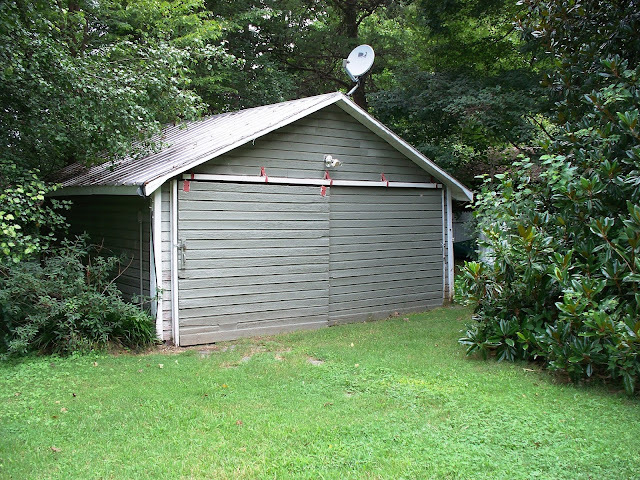 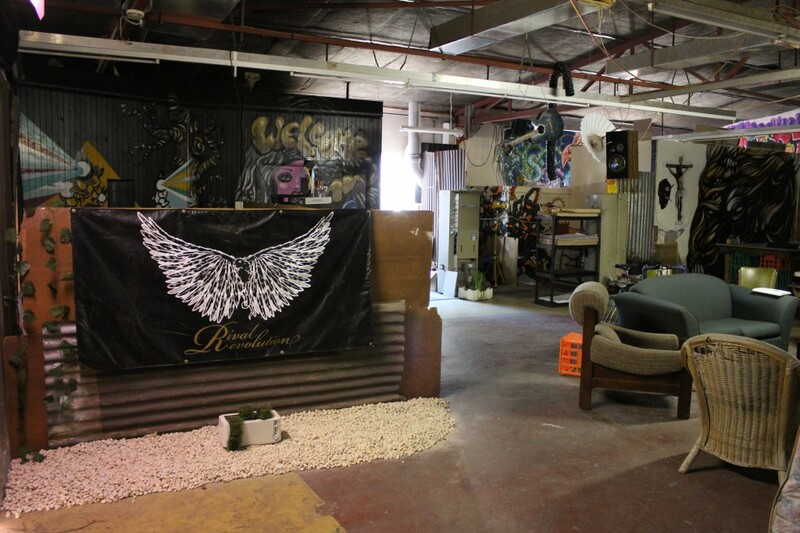 There is a one-car garage on the property that over time has lost its street access, but makes for a marvelous workshop or artist’s studio . 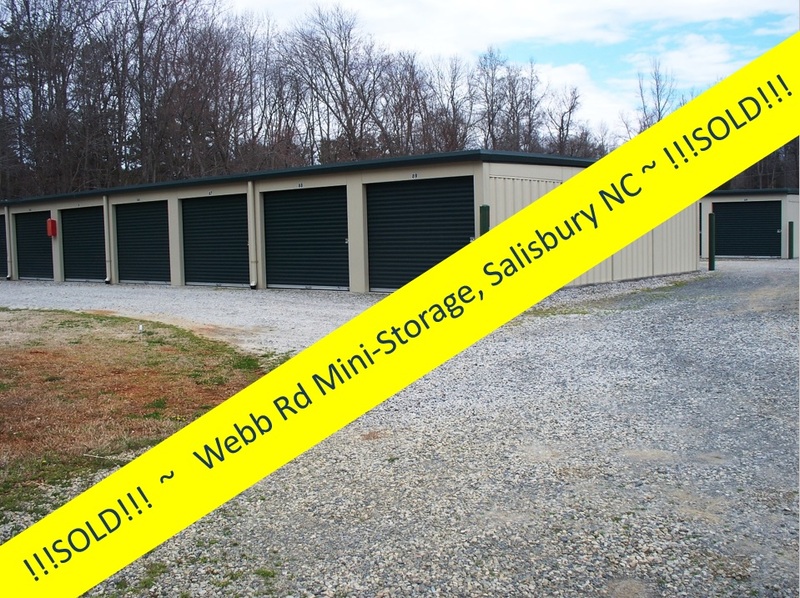 . . or just additional storage space. 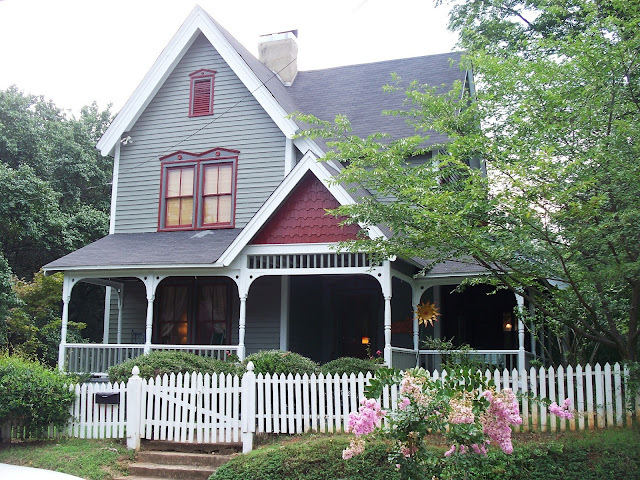 The exterior of the 1893 Mary Steele Scales House has just (July 2013) been repainted and the home is in mint ~ move-in condition. 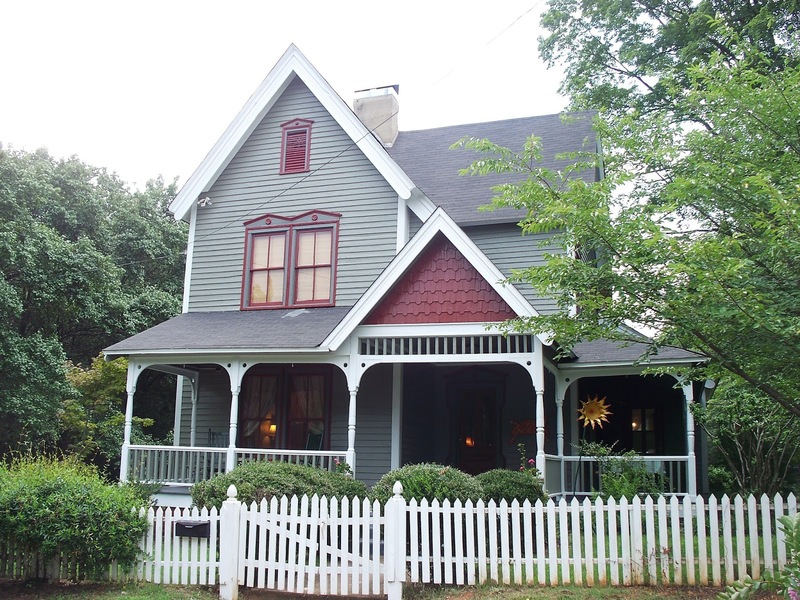 The circa 1893 Mary Steele Scales House is located in the North Main (NOMA) historic district. In John Steele’s day (the late 1700’s-early 1800’s), the area was largely plantations. 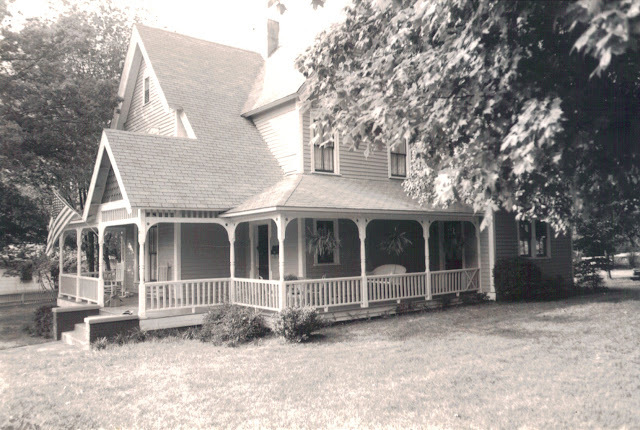 A period of extensive development in the North Main Street area occurred between 1920 and 1930. 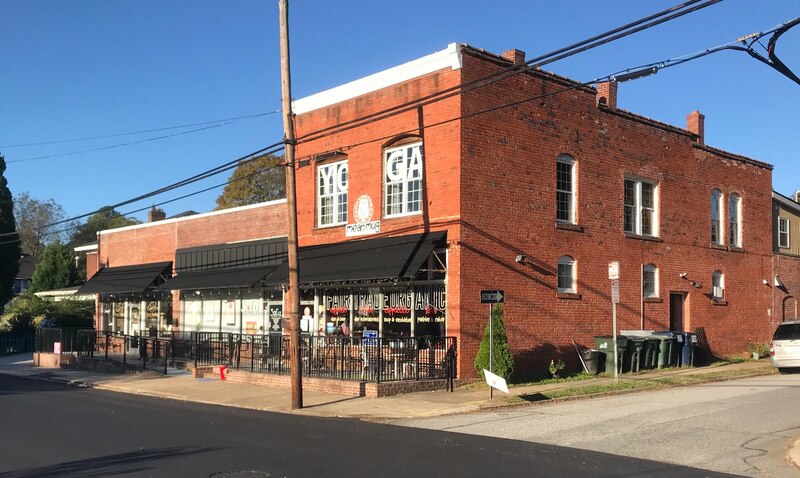 It was during this decade that the entire area along both sides of North Main Street was developed and streets to the east of North Main such as Miller, Lee, Scales, Steele, and Eleventh Streets were first developed. 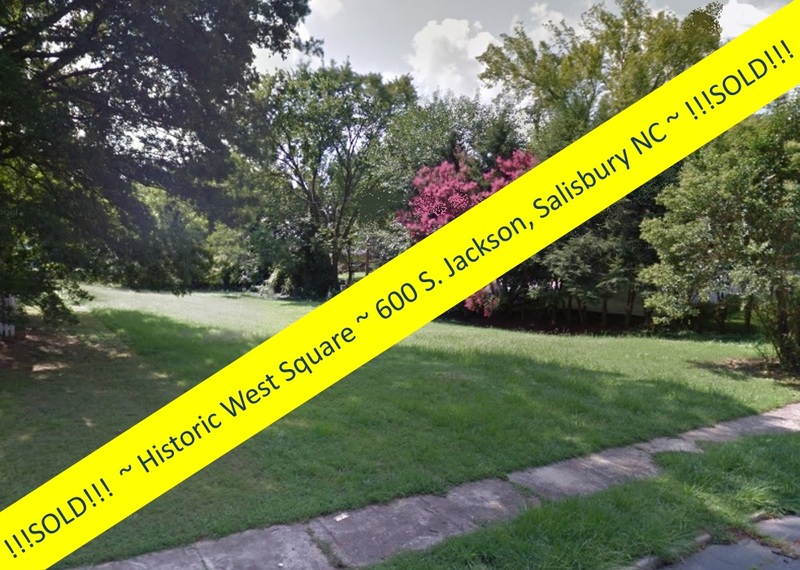 Much of this building activity came about through the development of "Steele Park," a beautiful residential section, developed on land comprising the old John Steele Plantation, which had descended through the Steele-Henderson family until its sale to developers in 1923. 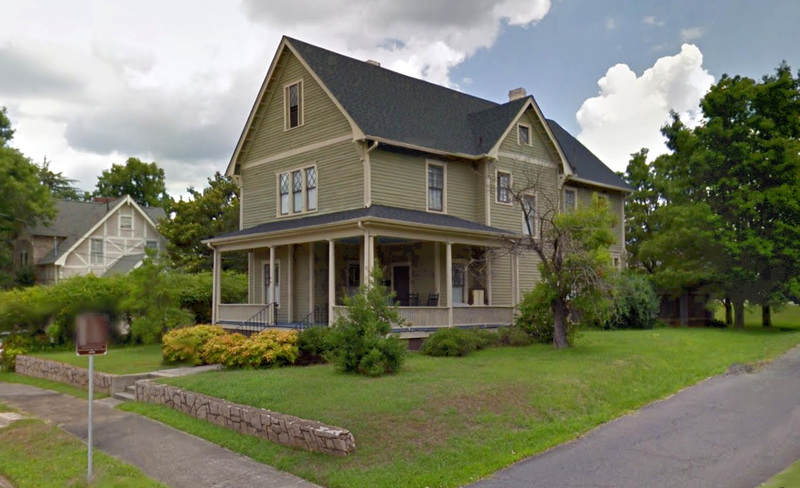 One of the most important ways in which we determine which properties are historic and which are not is through the National Register of Historic Places. 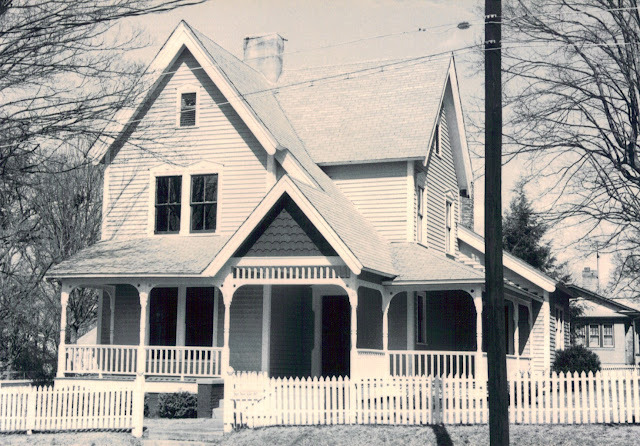 Since its creation by an act of Congress in 1966, the National Register has been one of the foundations of historic preservation across the country and in North Carolina. 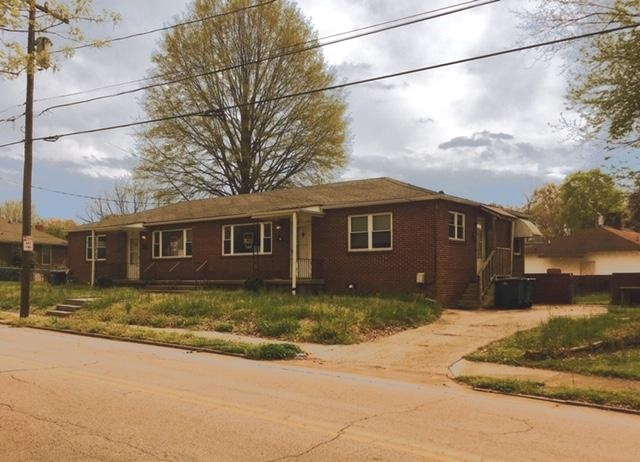 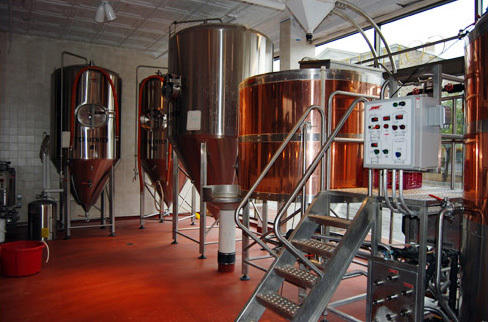 It provides uniform standards, a public process, and a national perspective for determining the significance and preservation worthiness of properties. 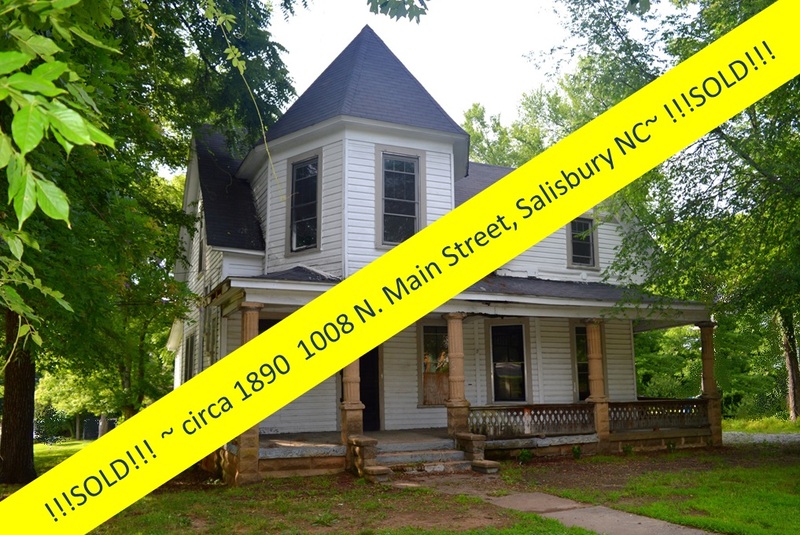 Although the criteria for determining National Register eligibility are essentially unchanged since 1966, their interpretation and application to properties are continuously clarified and updated through published guidance, bulletins, and precedent-setting National Register listings. 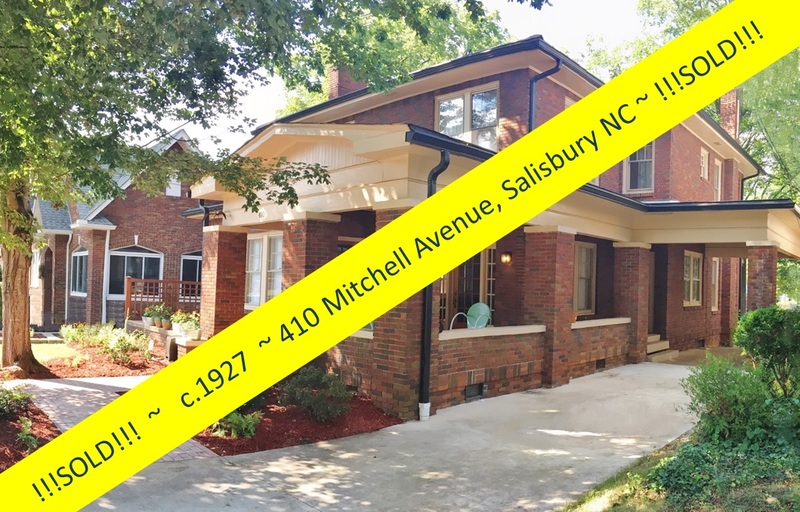 Listing in the National Register or determining National Register eligibility are among the clearest statements of public policy about what is historic and worthy of being preserved. 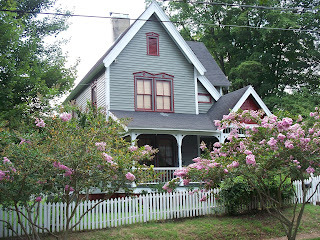 The Mary Steele Scales House is listed on the National Register of Historic Places. 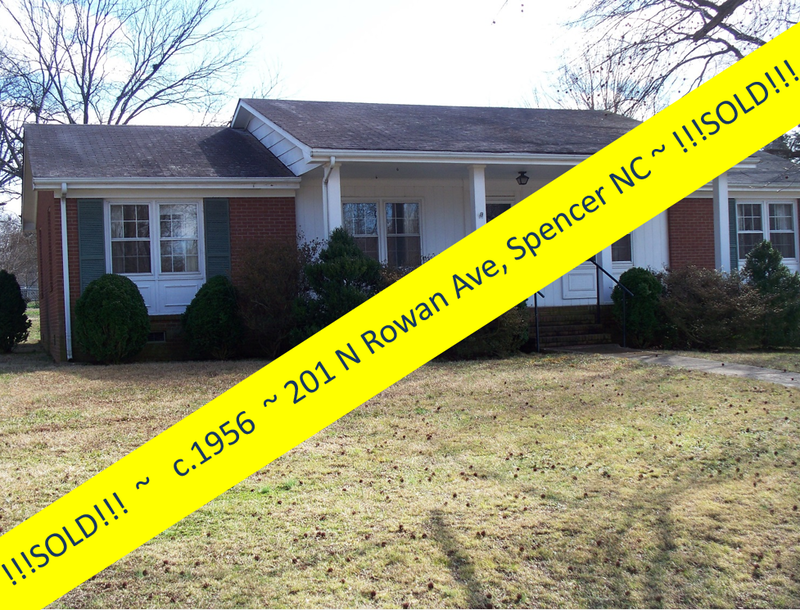 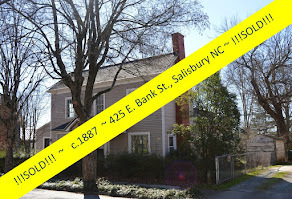 The Historic Salisbury Foundation covenants and restrictions convey with deed and are recorded on Rowan County deed book 630 page 530. 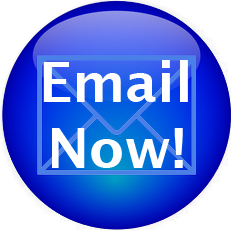 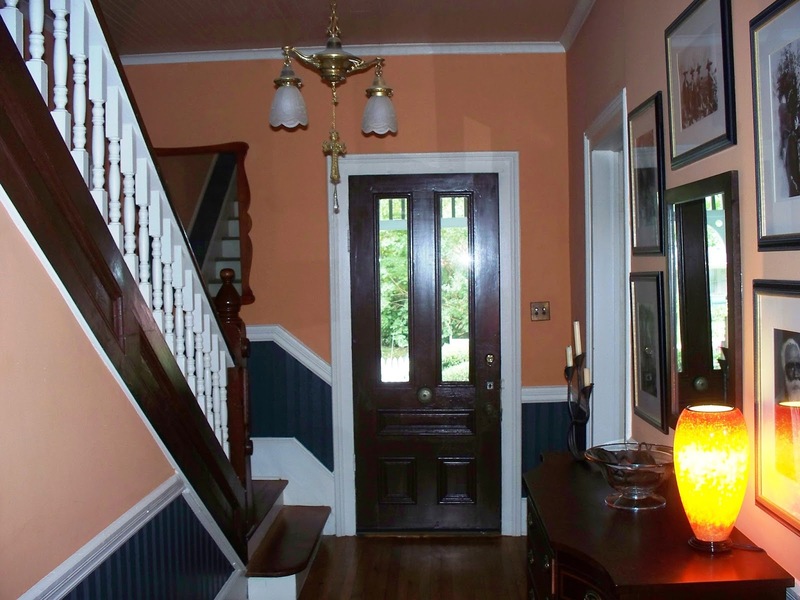 When real estate agents talk to you about ‘vintage’ or ‘antique’ homes, let them. 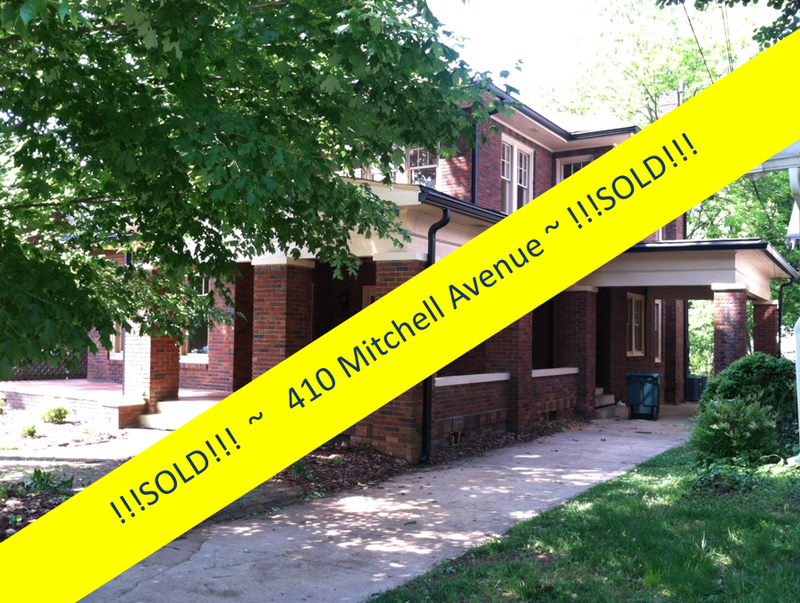 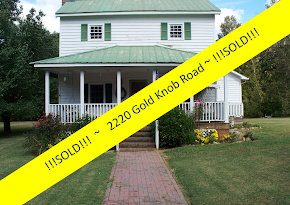 . . but do not let them fool you into buying a ‘historic’ home without the credentials to back it up. 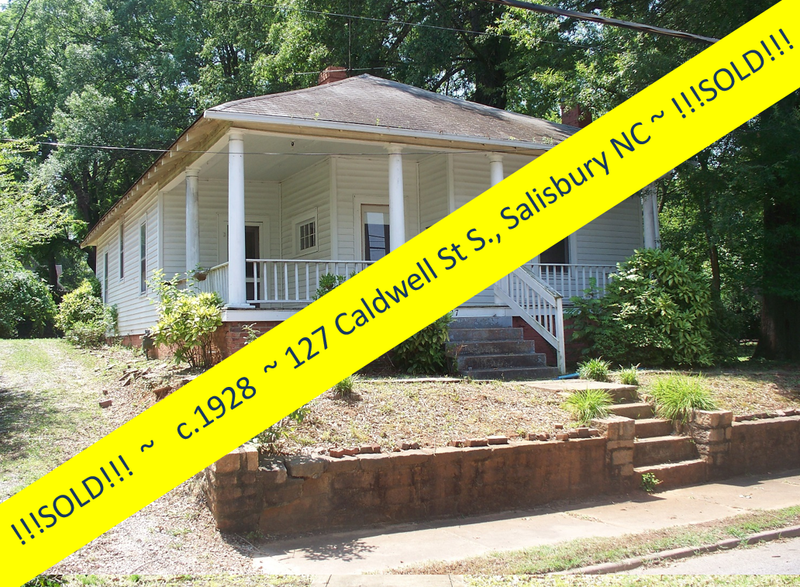 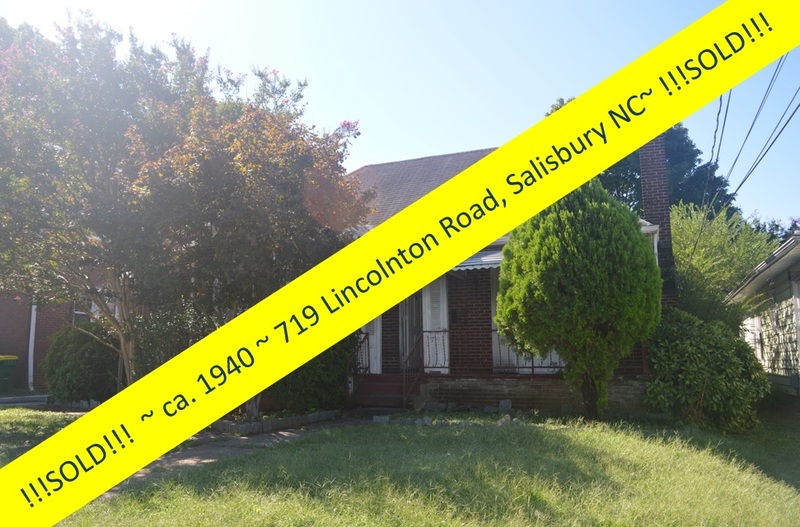 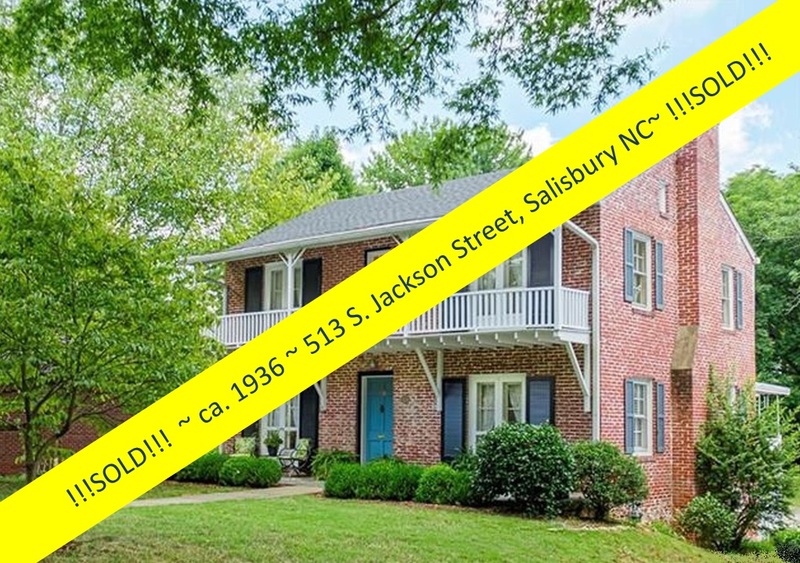 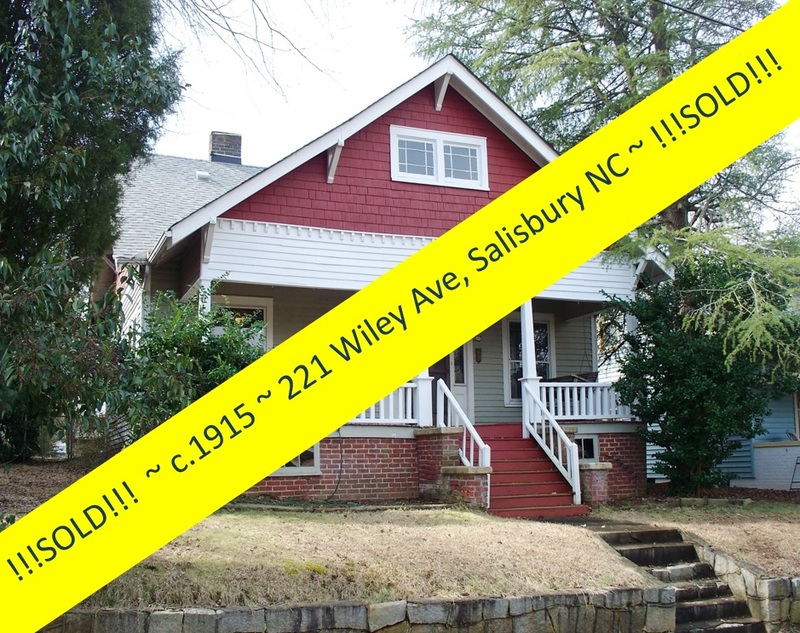 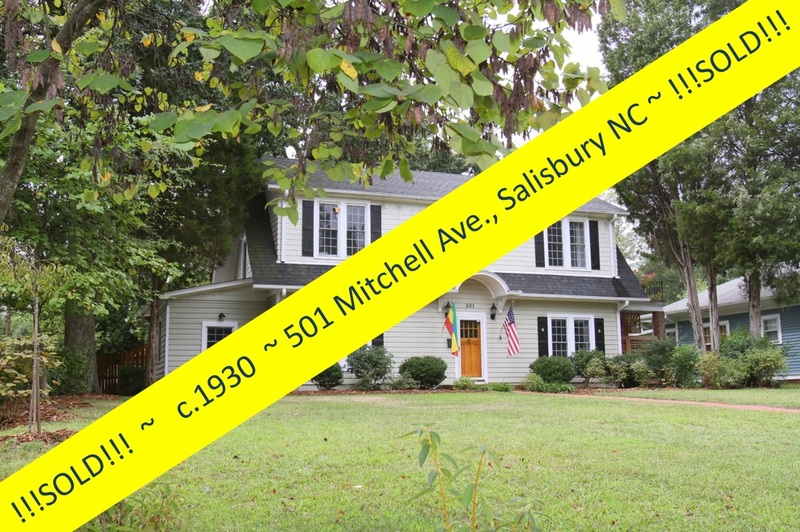 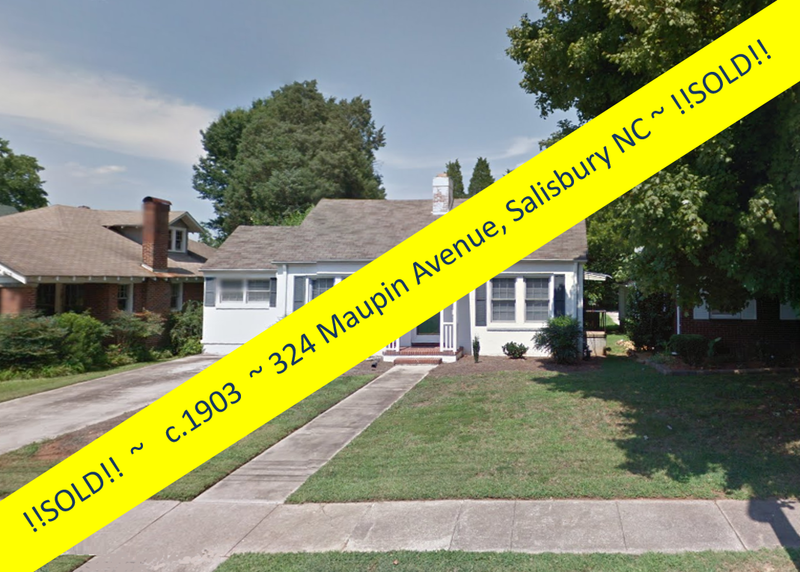 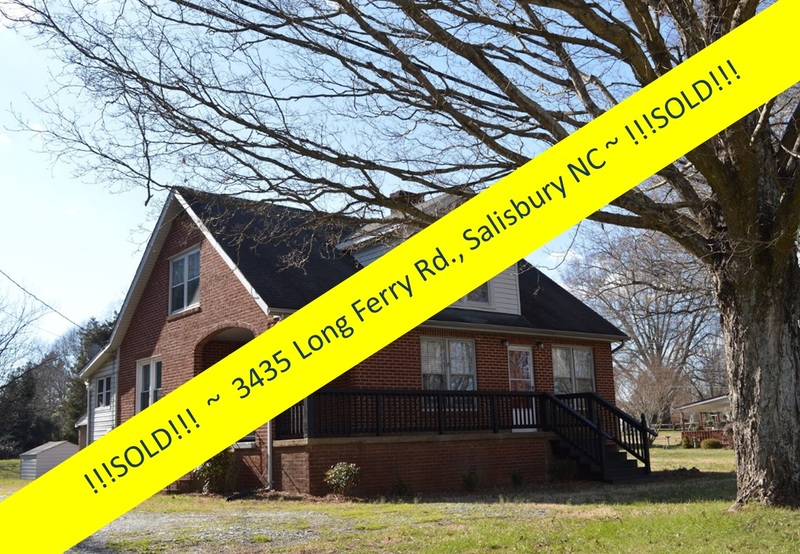 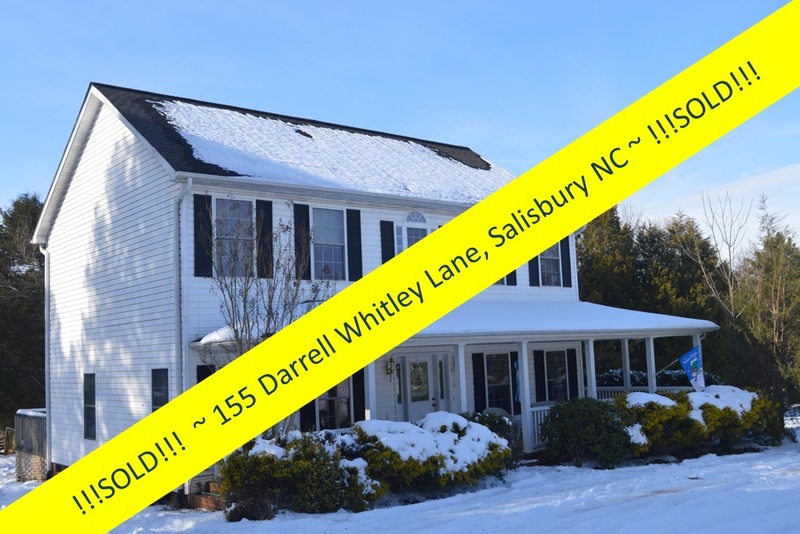 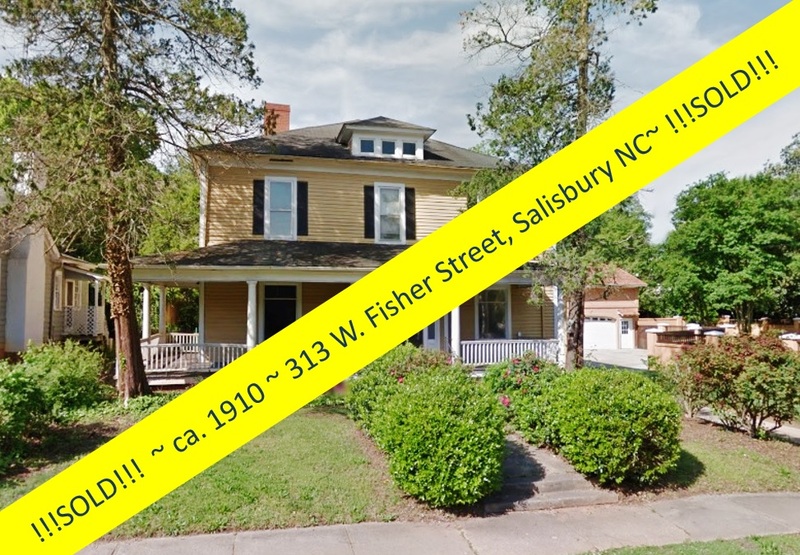 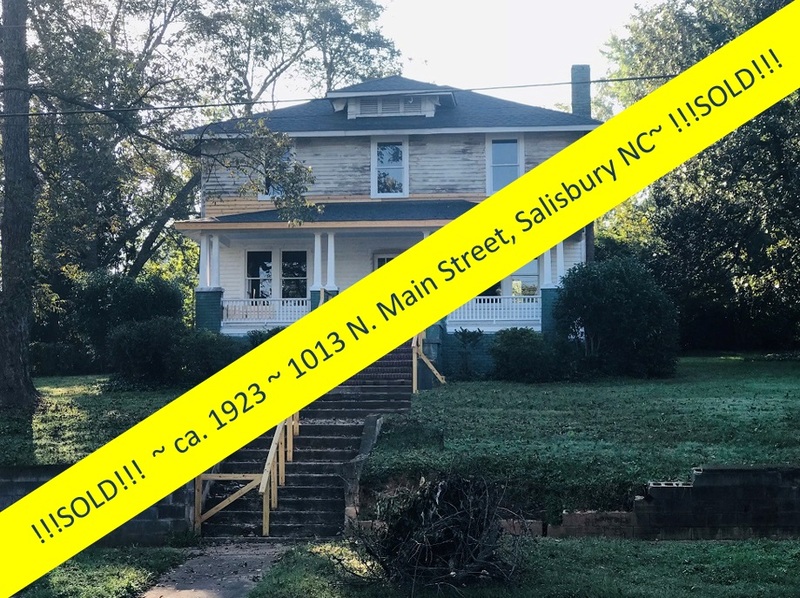 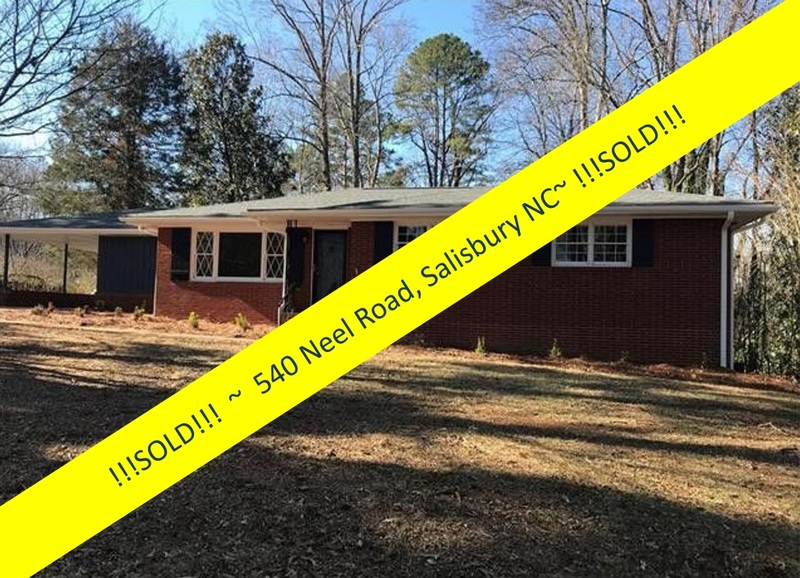 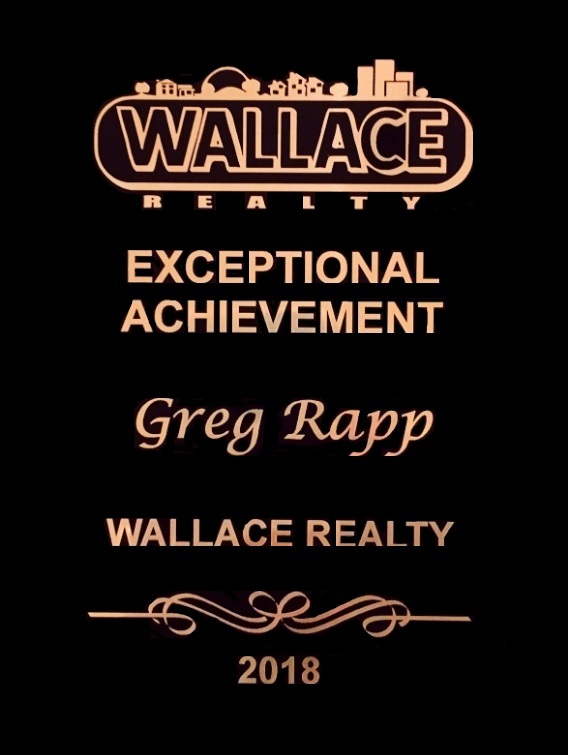 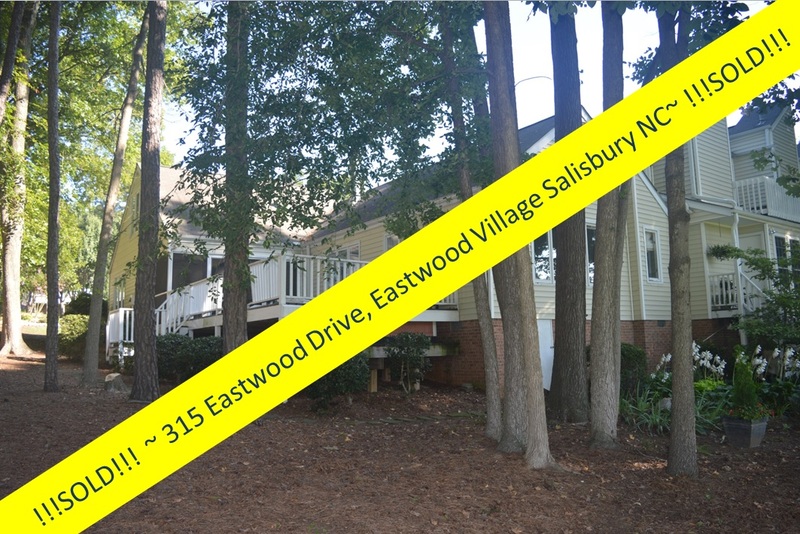 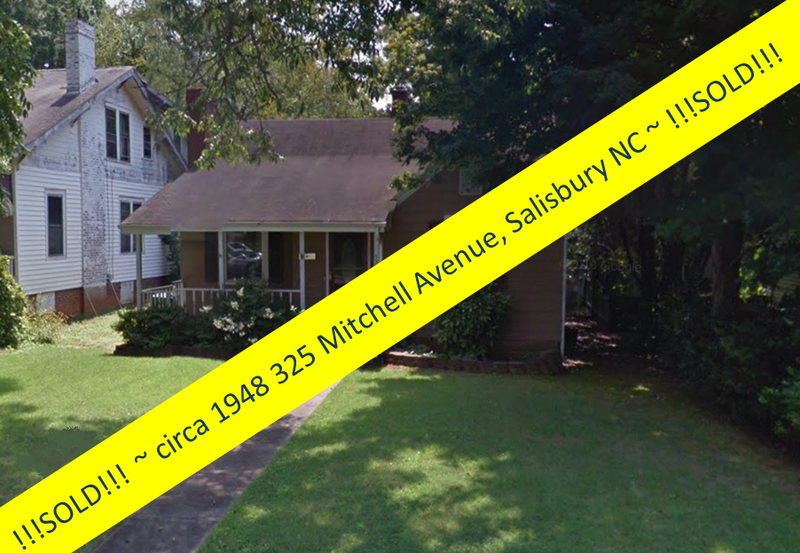 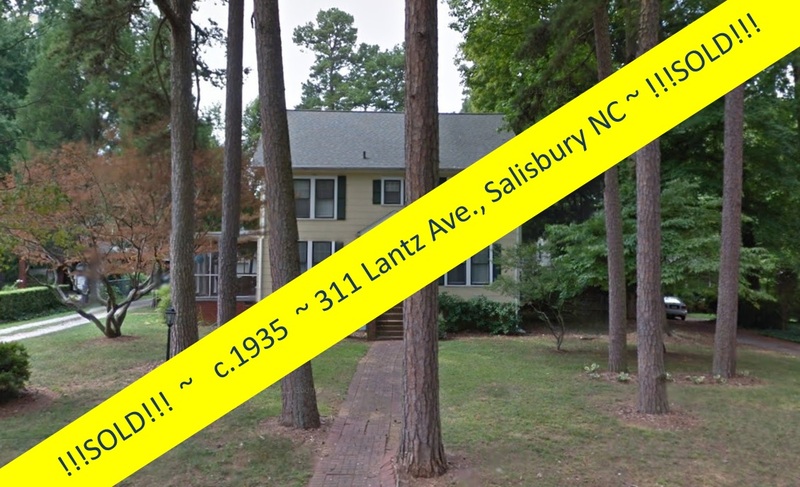 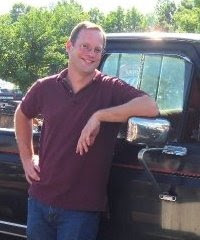 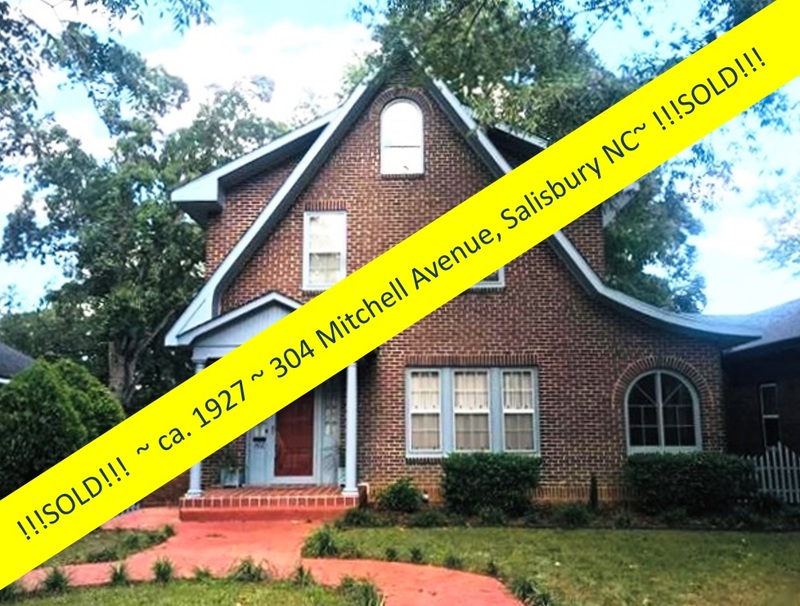 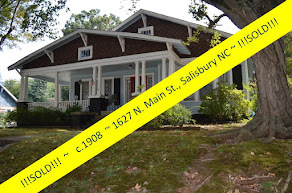 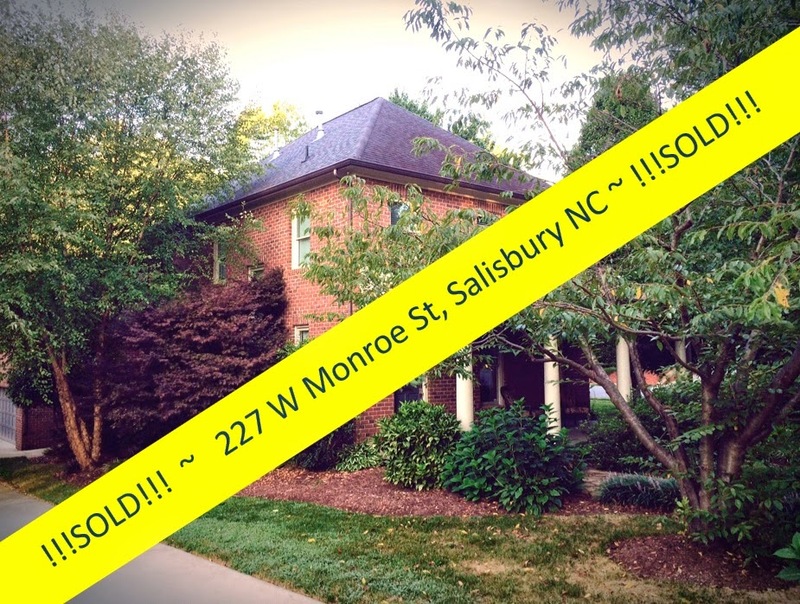 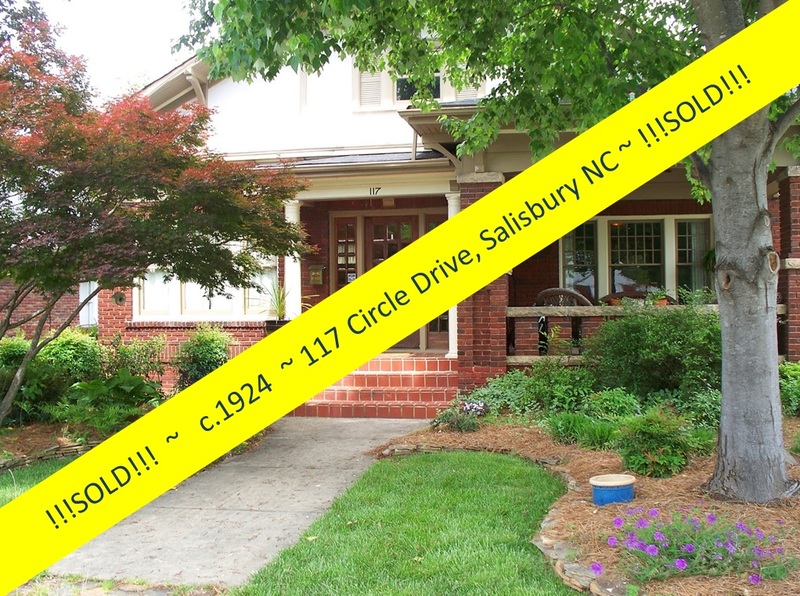 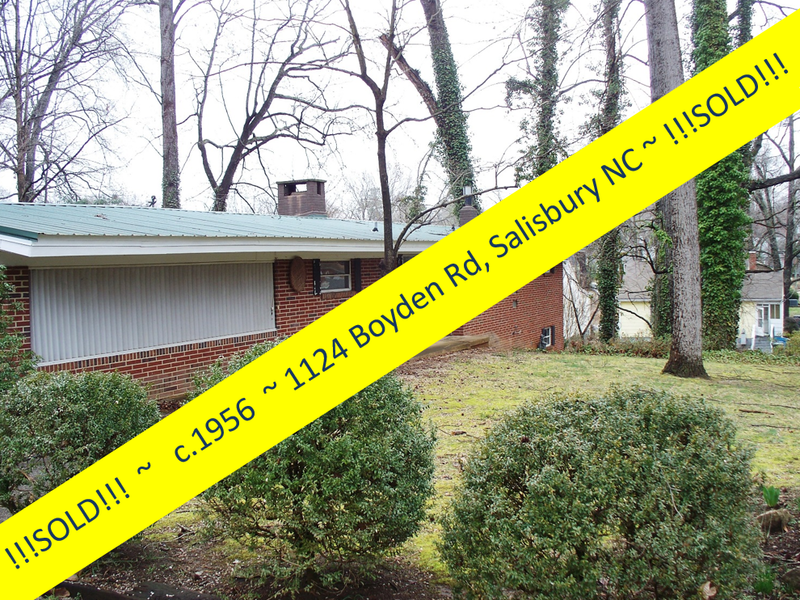 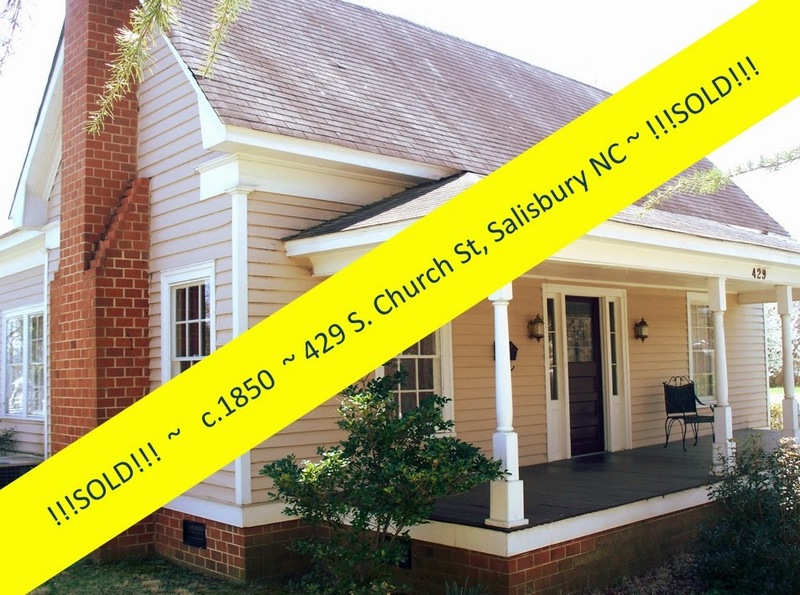 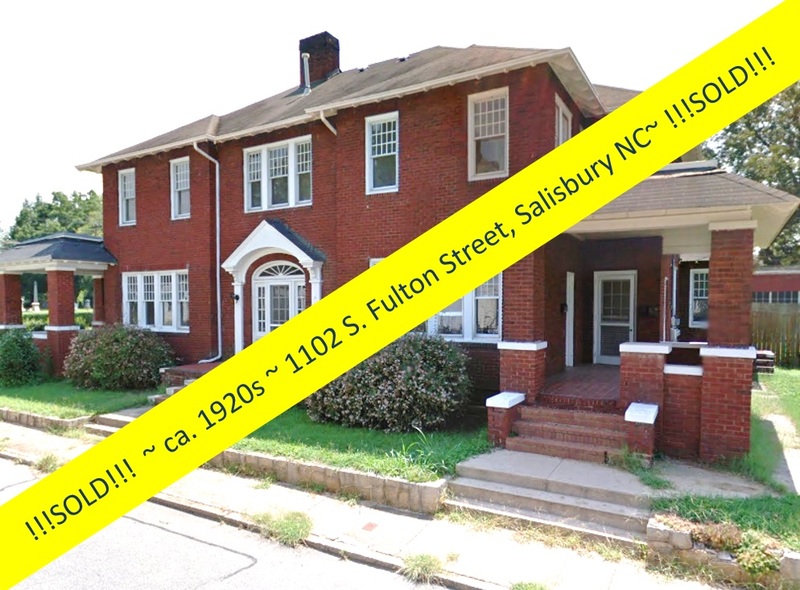 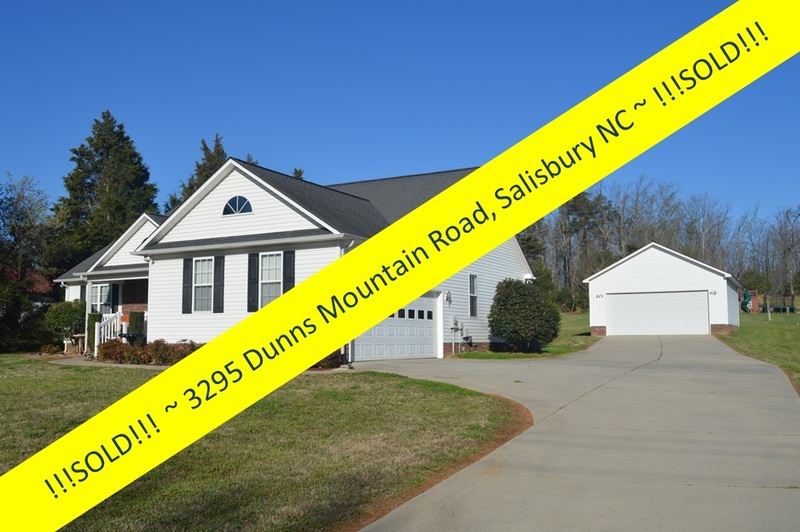 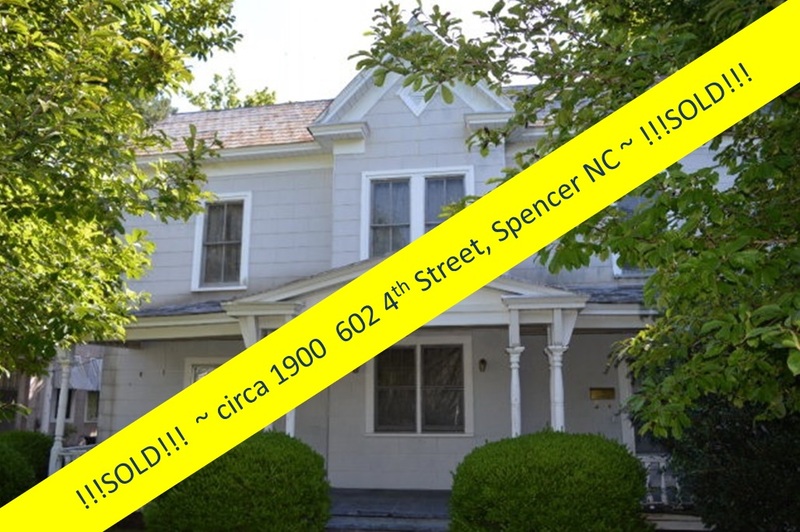 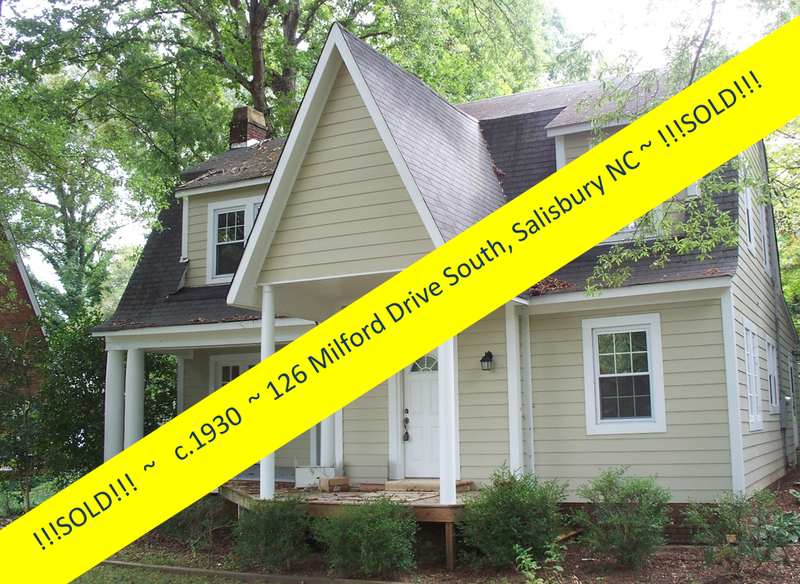 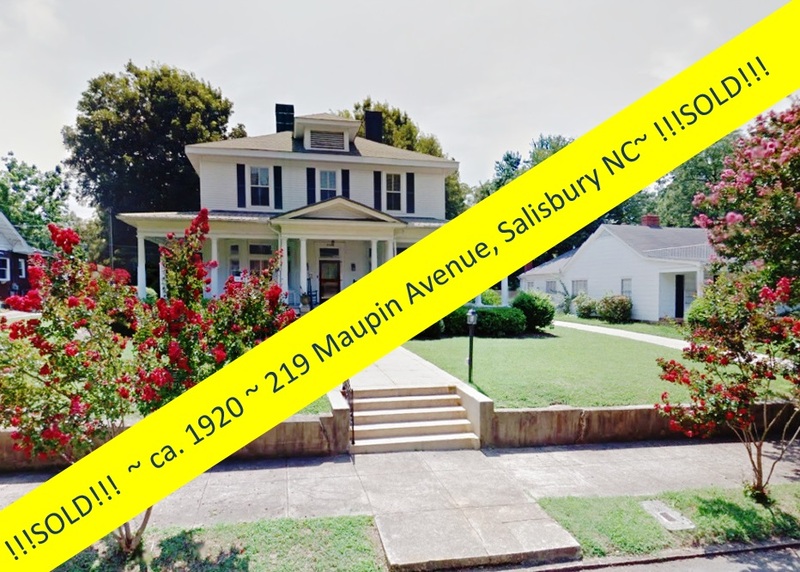 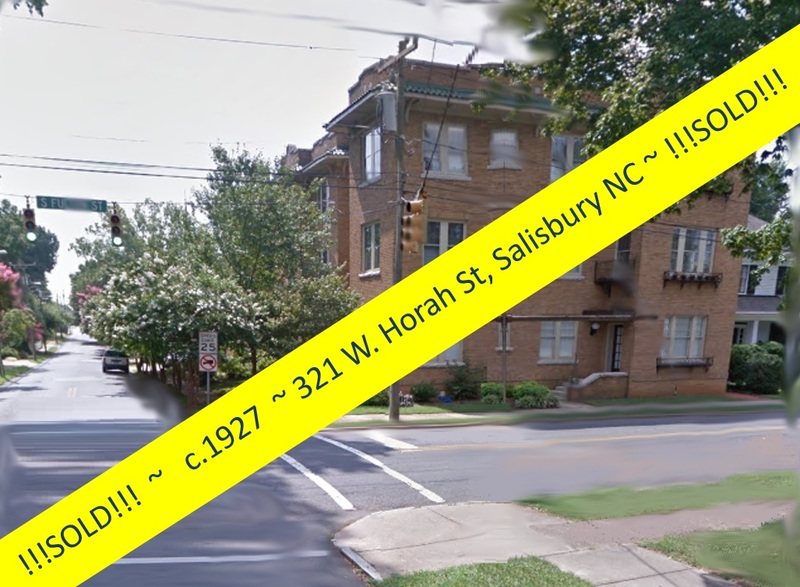 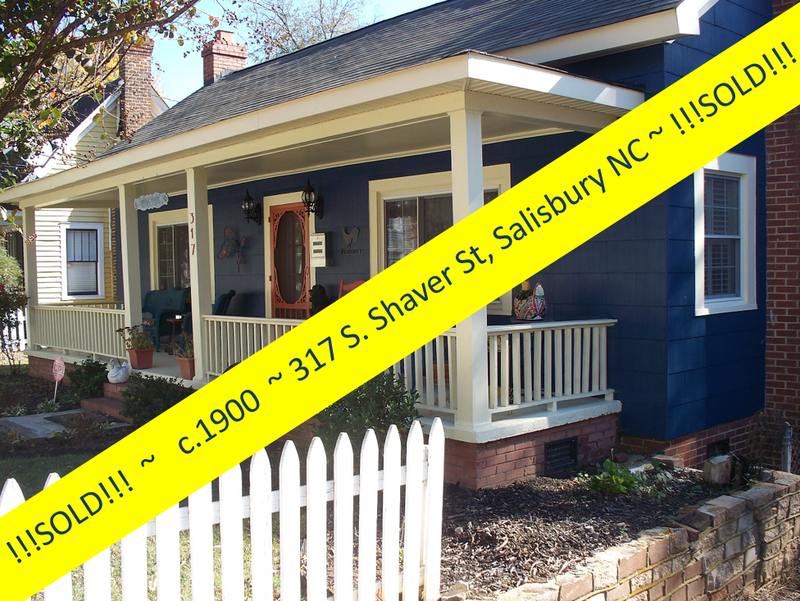 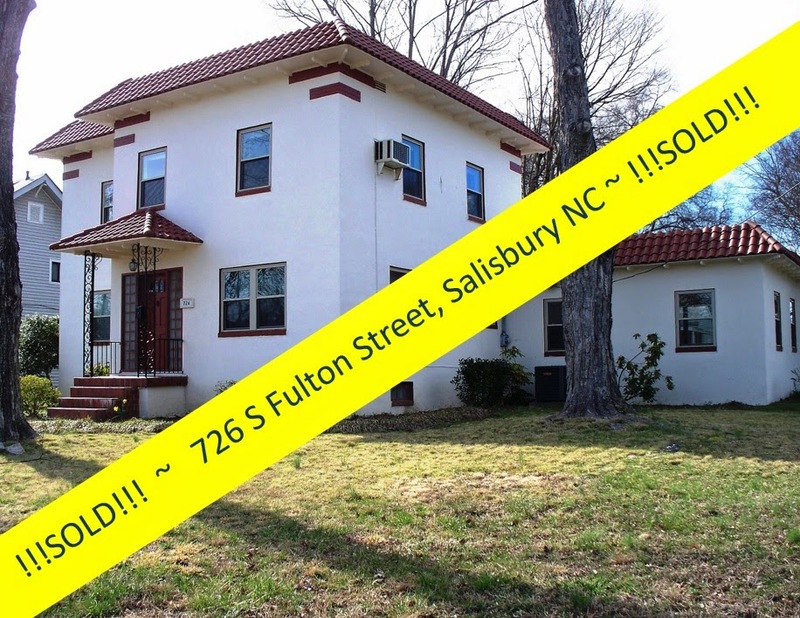 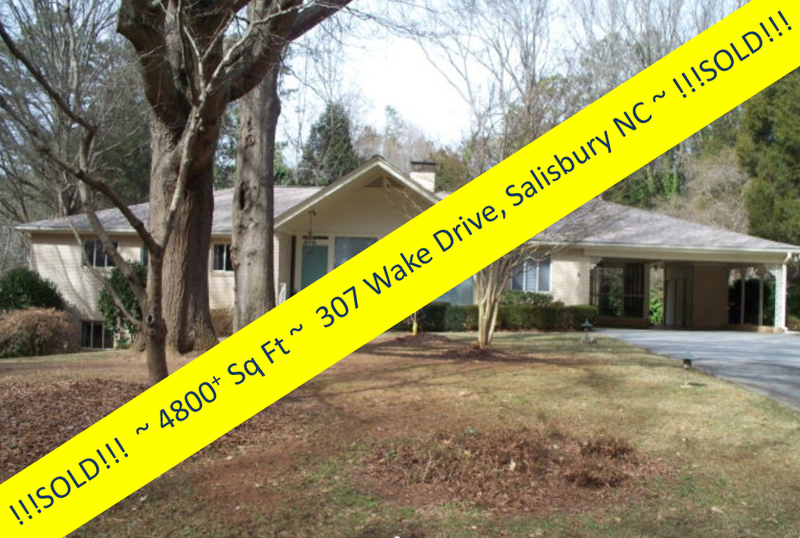 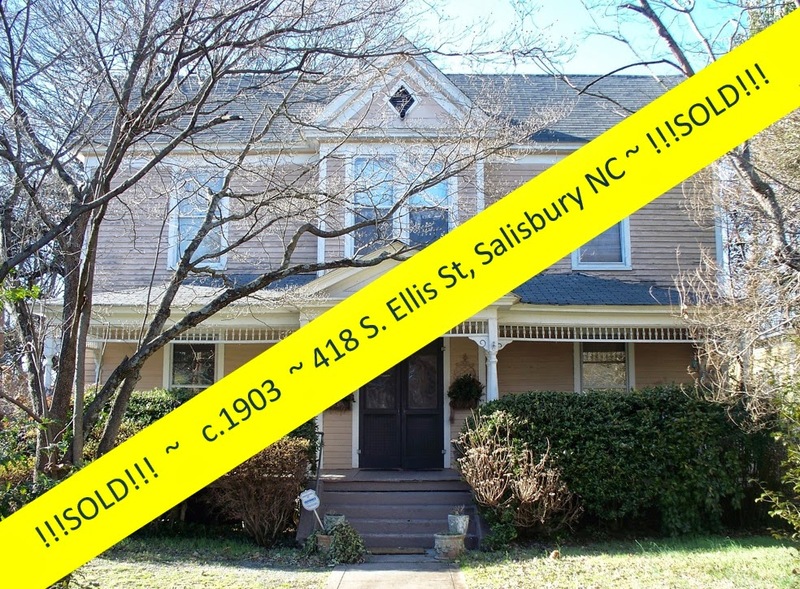 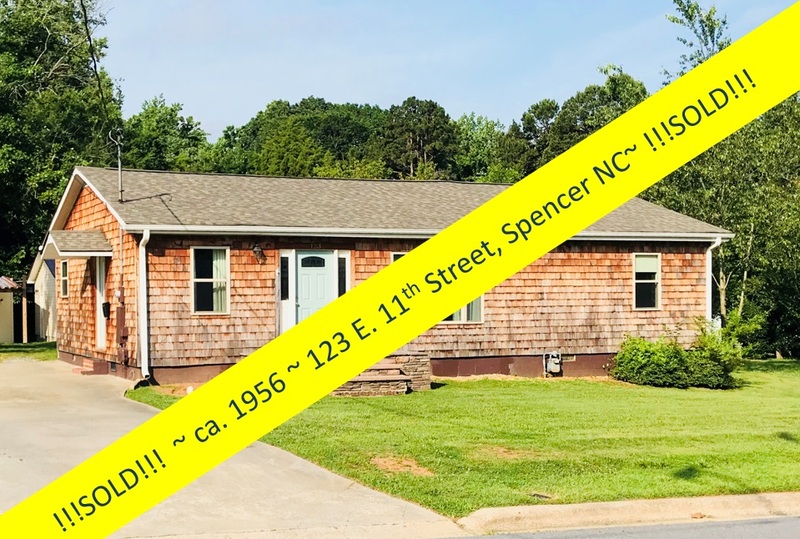 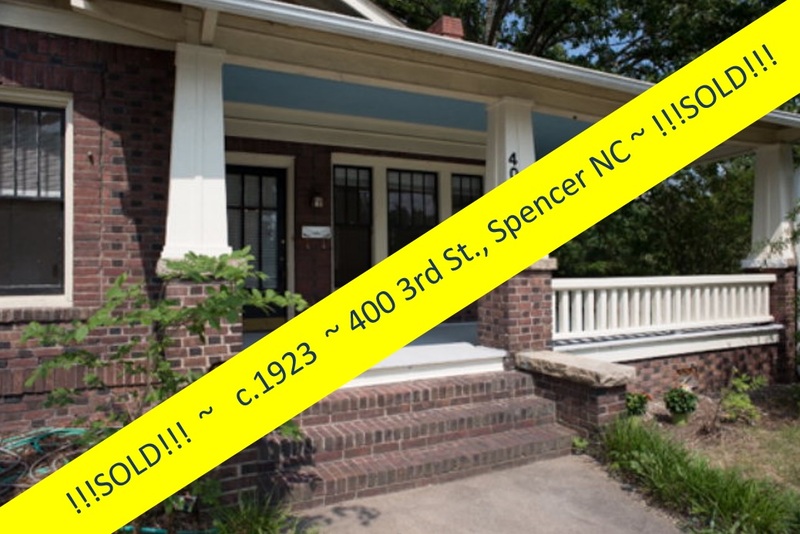 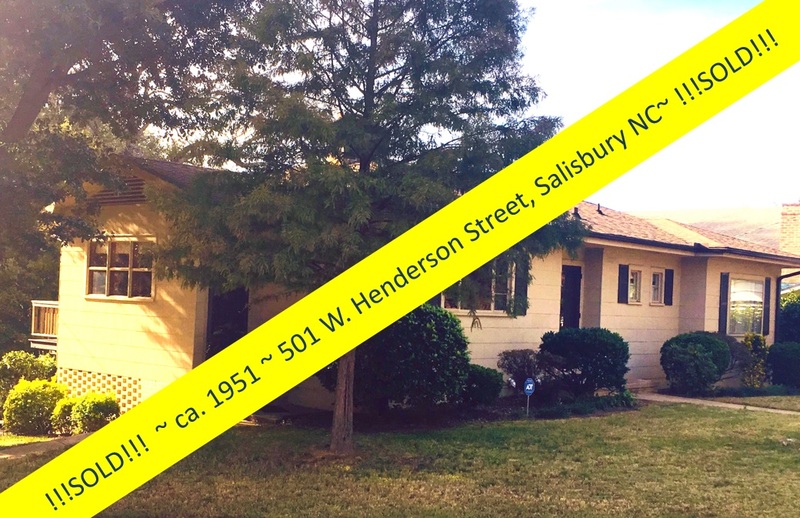 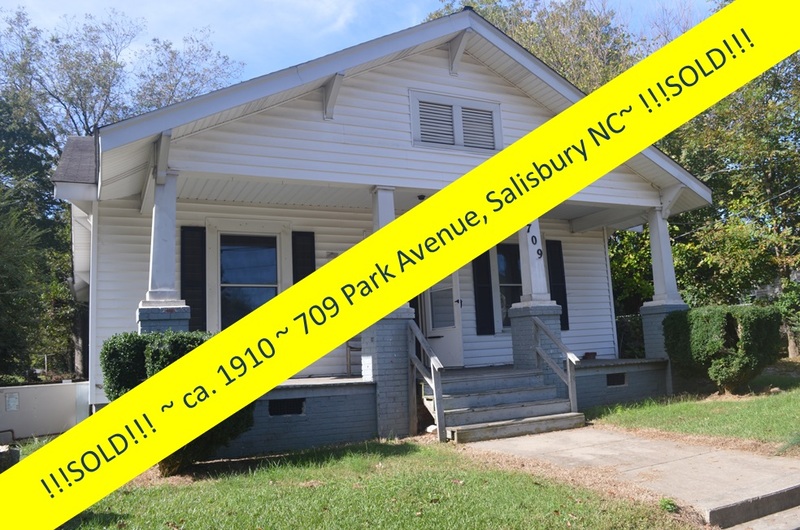 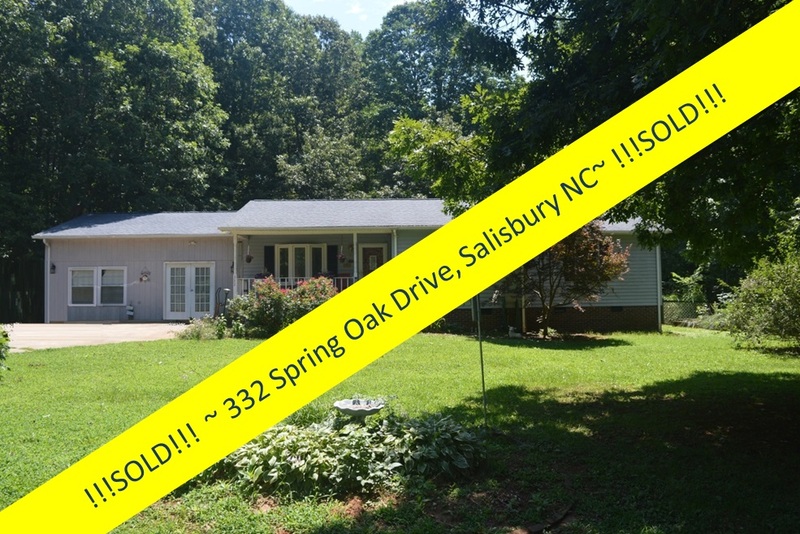 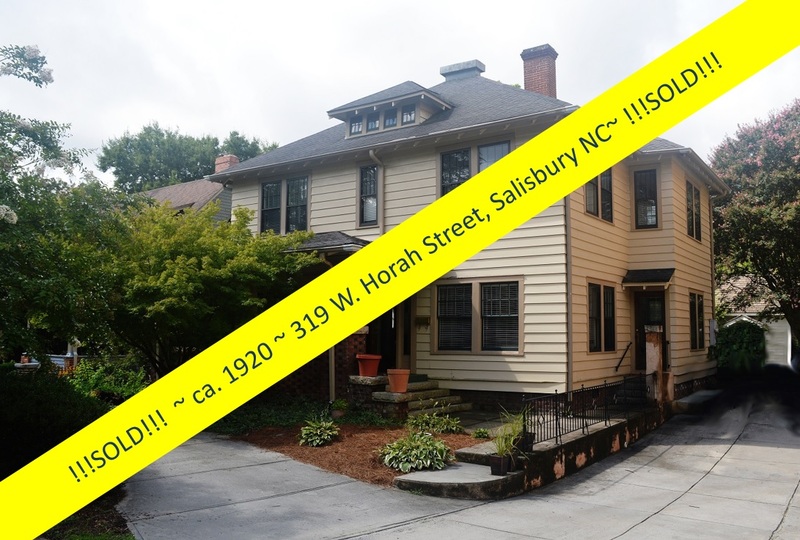 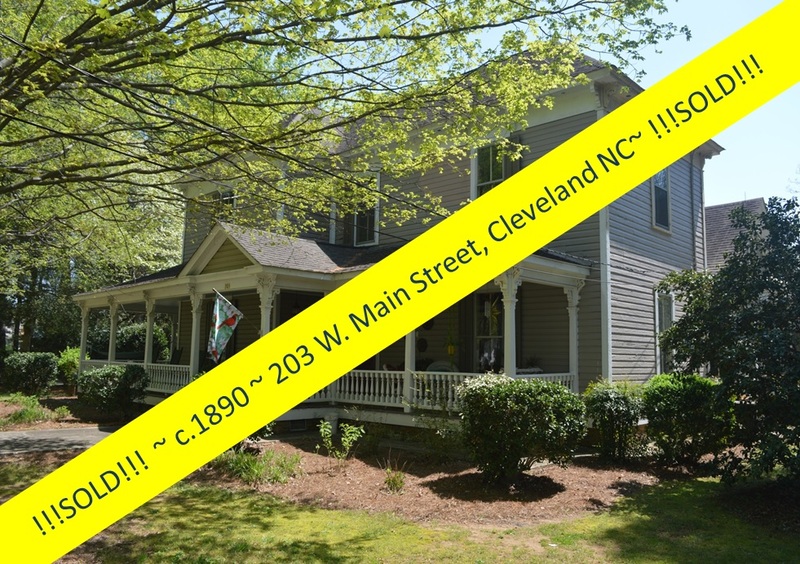 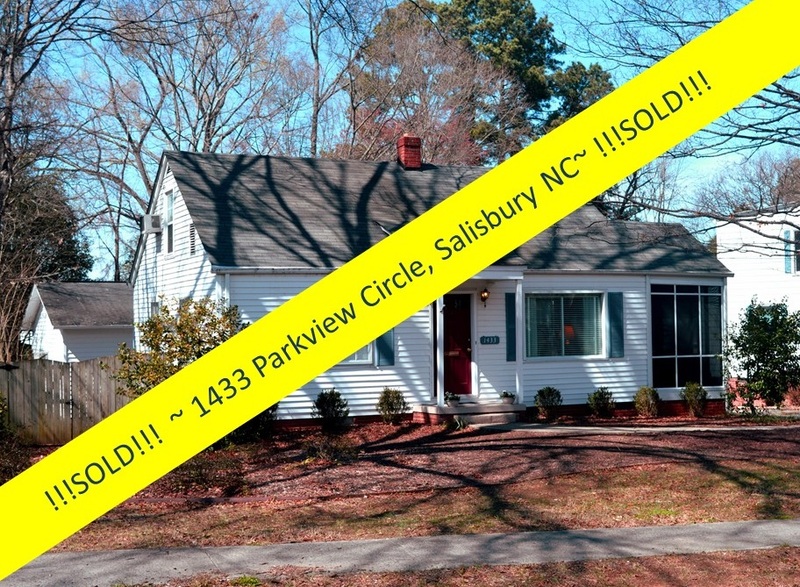 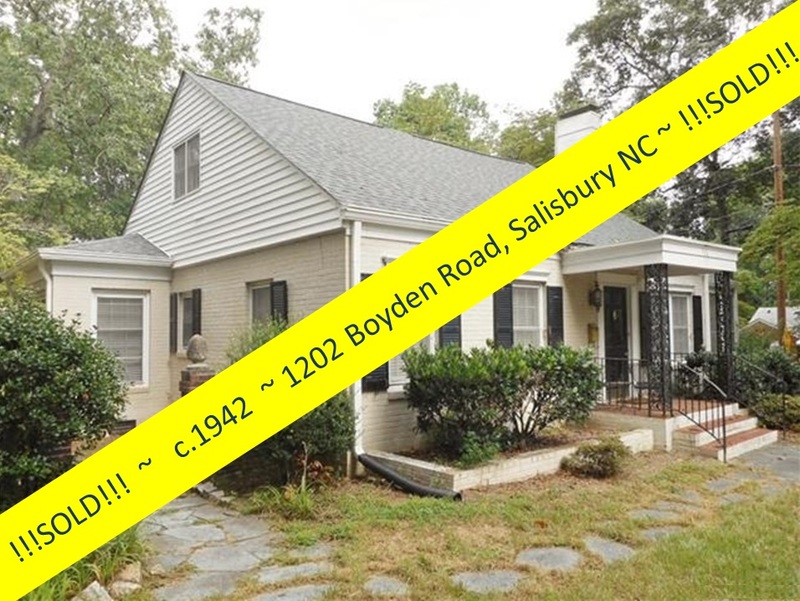 There are a plethora of very fine vintage and antique homes in Salisbury, NC (ask Greg Rapp ~ the area’s premier purveyor of older homes ~ 704.213.6846), and a wonderful selection of historic neighborhoods, but not all homes in these districts are historic. The Mary Steele Scales House, circa 1983, at 126 E. Steele Street, is the real deal. 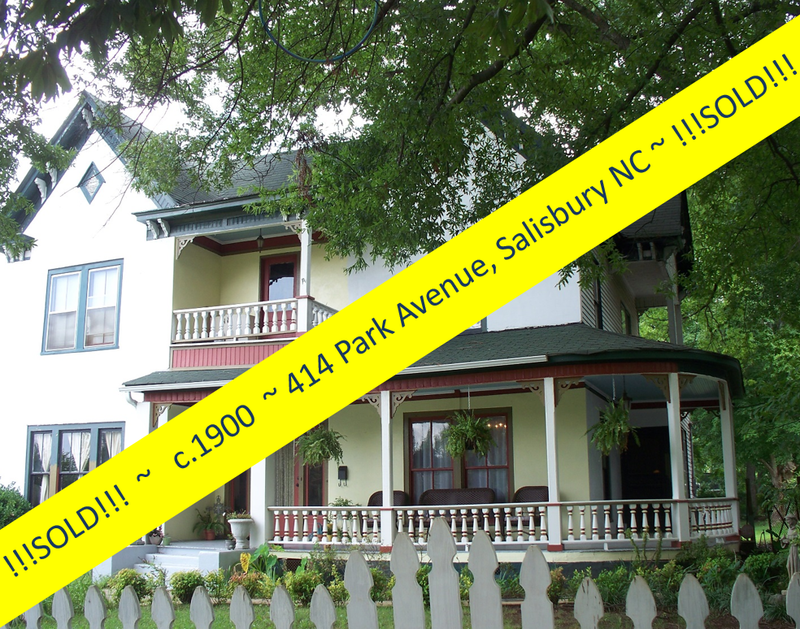 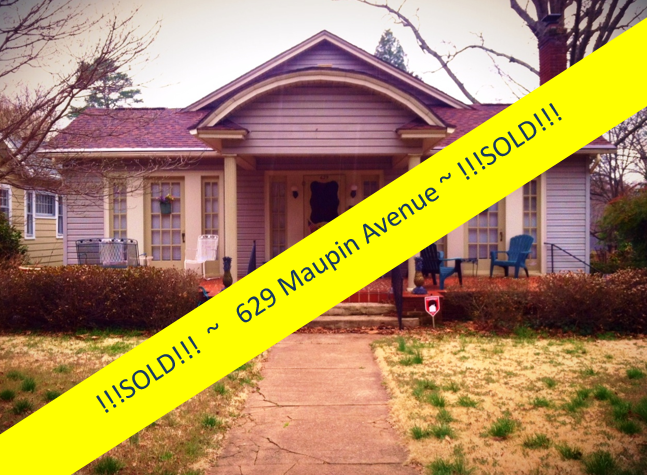 And at just $144,900 ~ is a STEAL! 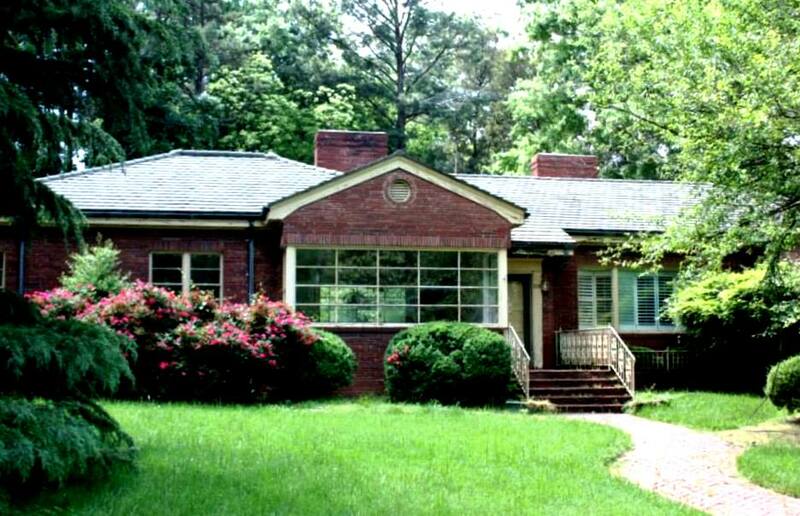 *John Steele’s land was known as the "Lombardy Plantation". 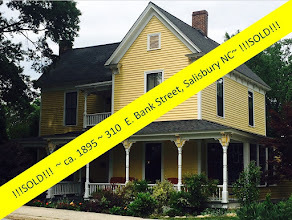 His house, Steele House, still stands in Salisbury, N.C., just one block from the Mary Steele Scales House. 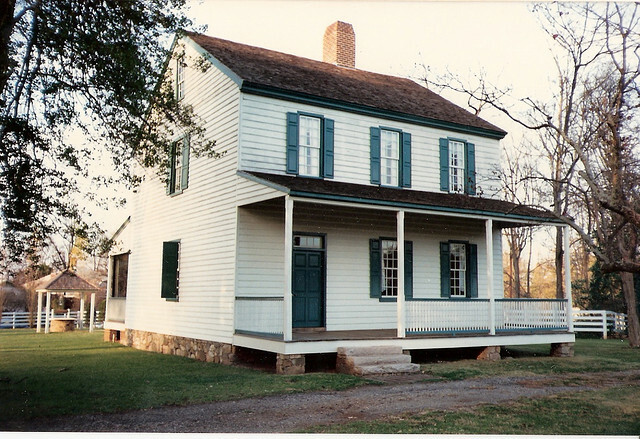 The circa 1799 John Steele House has undergone major renovation and restoration and is on the National Register of Historic Places. The national significance of Lombardy, the John Steele House, ultimately rests on its association with the life and career of John Steele. 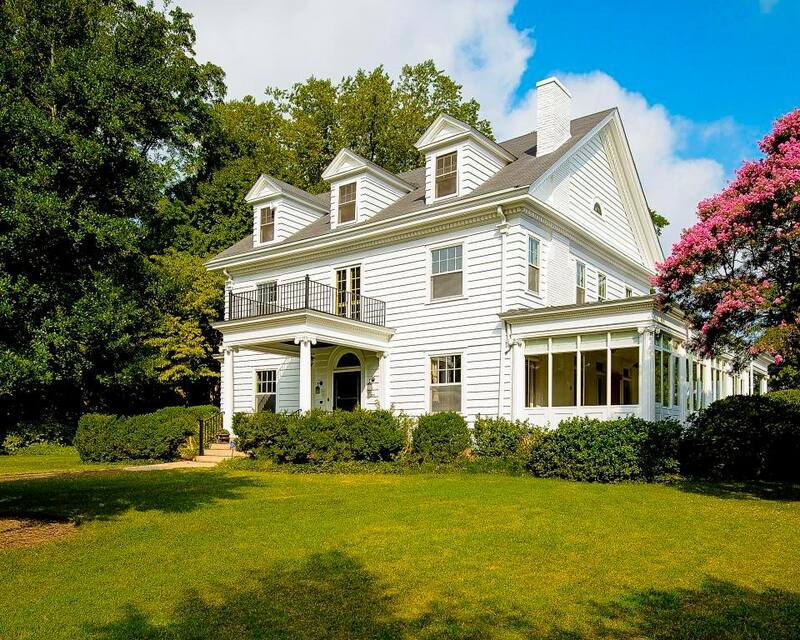 Constructed for him while he was Comptroller, the place at which he wrote his letter to Thomas Jefferson resigning the position, and the place to which he retired and ended his days, the house is associated with his six-Year career as the Comptroller of the Treasury, the second highest position in the largest, and most important administrative branch of the federal government.